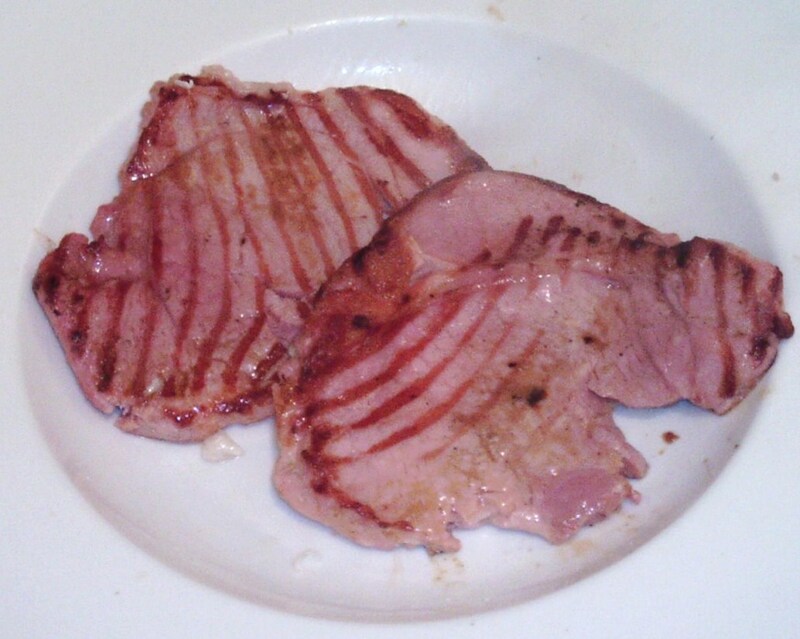 What's the Difference Between Bacon and Gammon Steaks? 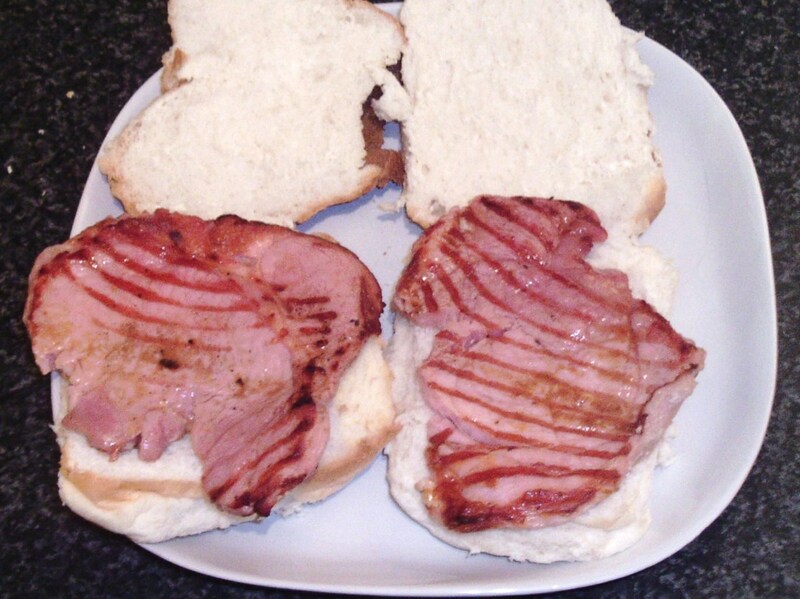 As is so often the case with food items, bacon and gammon steaks can sometimes be confused with one another and the precise difference(s) can prove to be a little bit ill-defined. 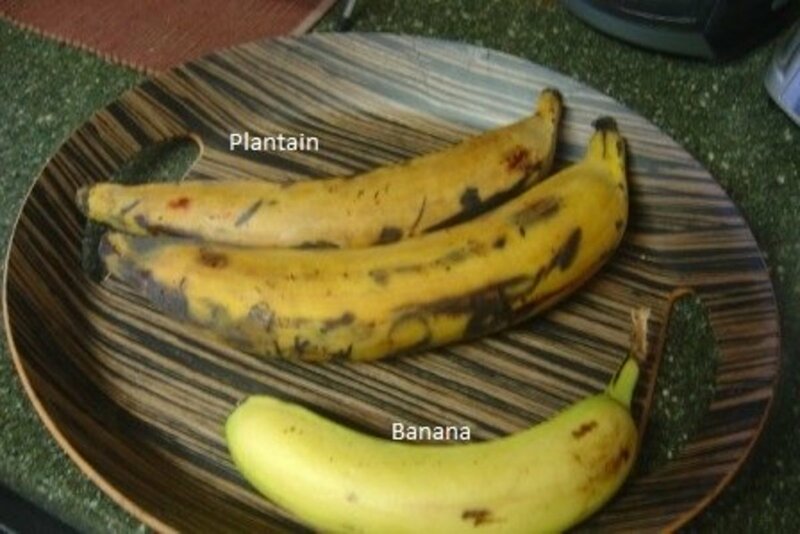 Both can be cured in different ways, some curing methods similar in each instance. 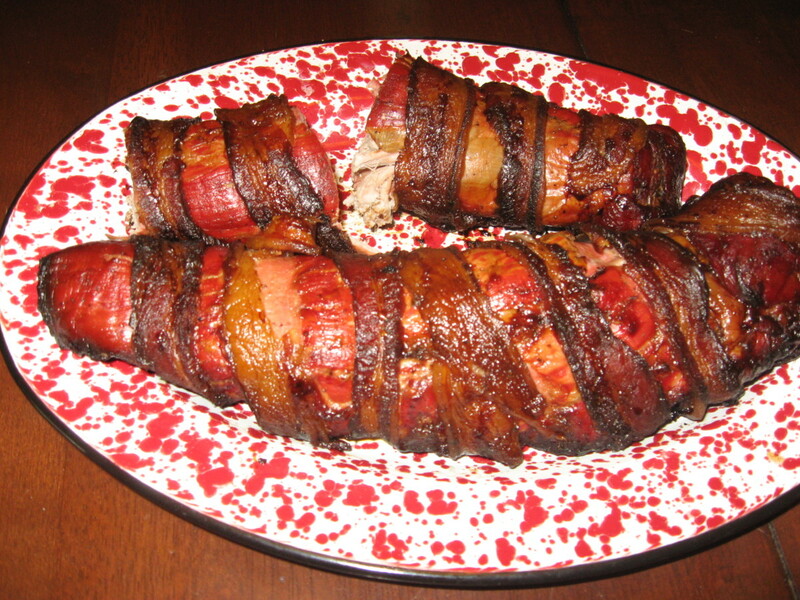 The one standard difference between the two is the part of the pig from which the meat is taken. 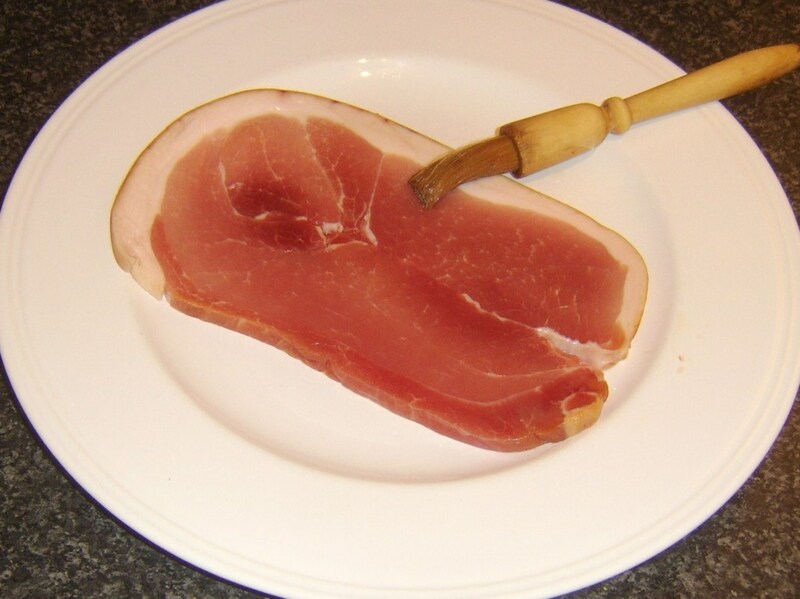 While bacon may be taken from the back, side, or belly of the pig - depending particularly upon where you are in the world - gammon is a word used to describe only meat taken from the pig's hind leg. The salsa should ideally be prepared at least a couple of hours in advance and refrigerated for the flavours to infuse to best effect but this is not essential. 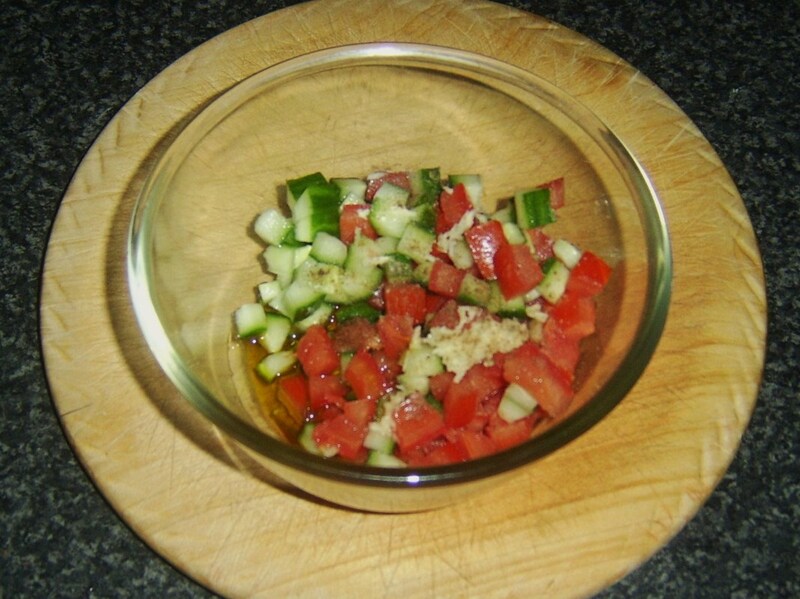 Combine the tomato, cucumber and garlic in a bowl, season with salt and pepper, drizzle with olive oil and stir well. 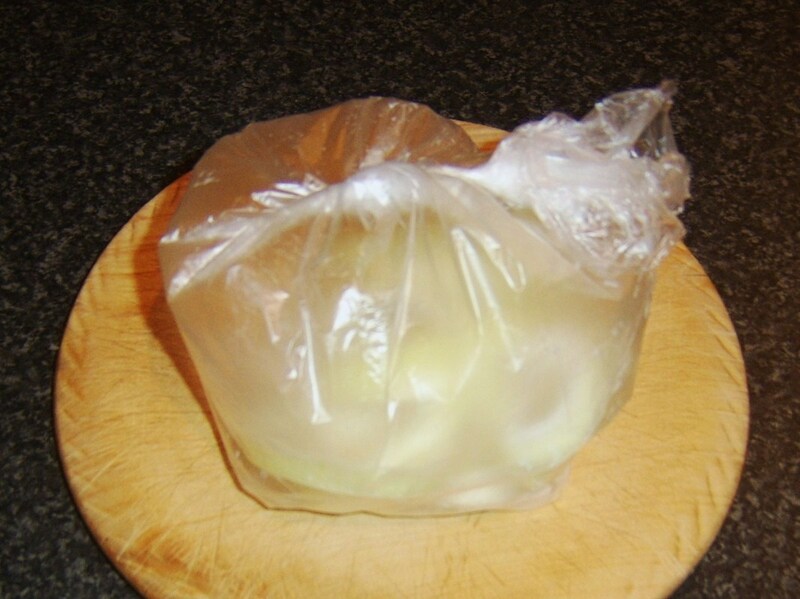 Cover with clingfilm and refrigerate until required. Put two tablespoons of the flour in to a bowl or deep plate. Season with salt and slowly add cold water as you whisk with a fork to form a thick, creamy batter. Refrigerate to rest for ten minutes. 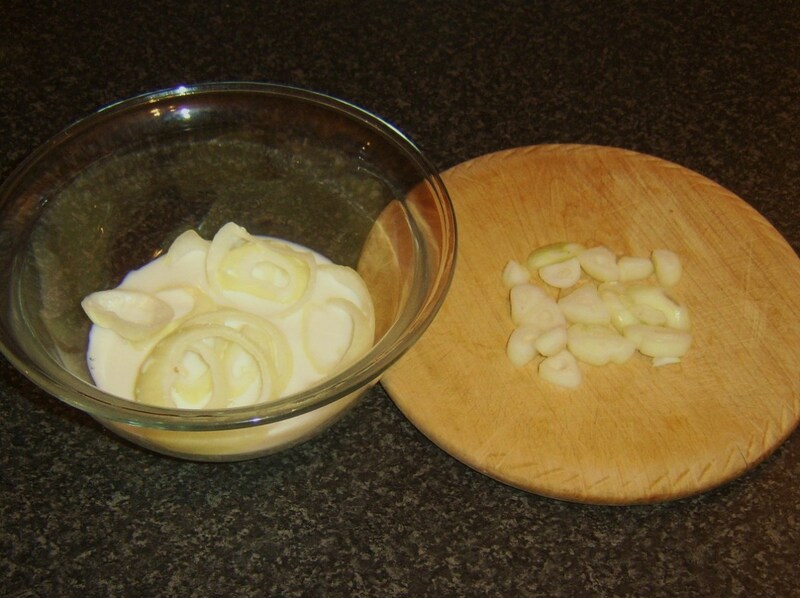 Separate the onion in to rings. The smaller, inner rings should be reserved for alternative use at a later time. 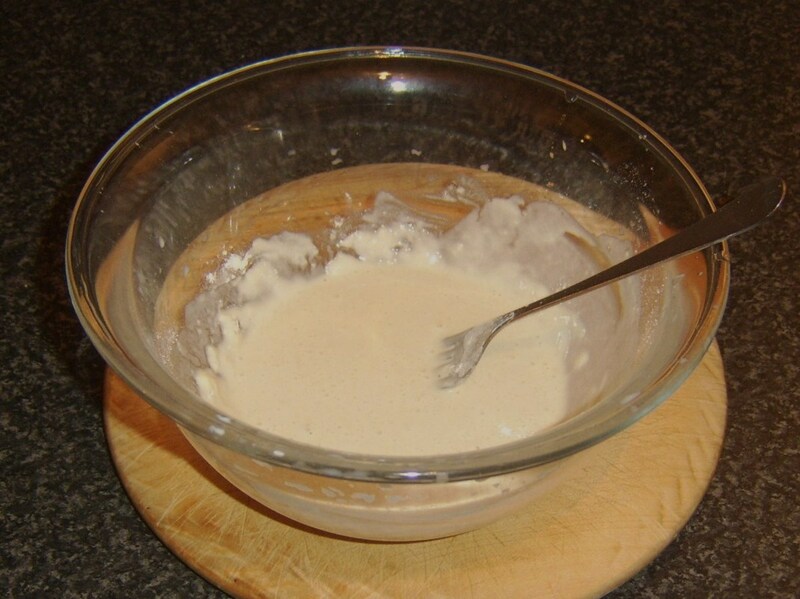 Add to a bowl with enough milk to completely cover and set aside for five minutes. 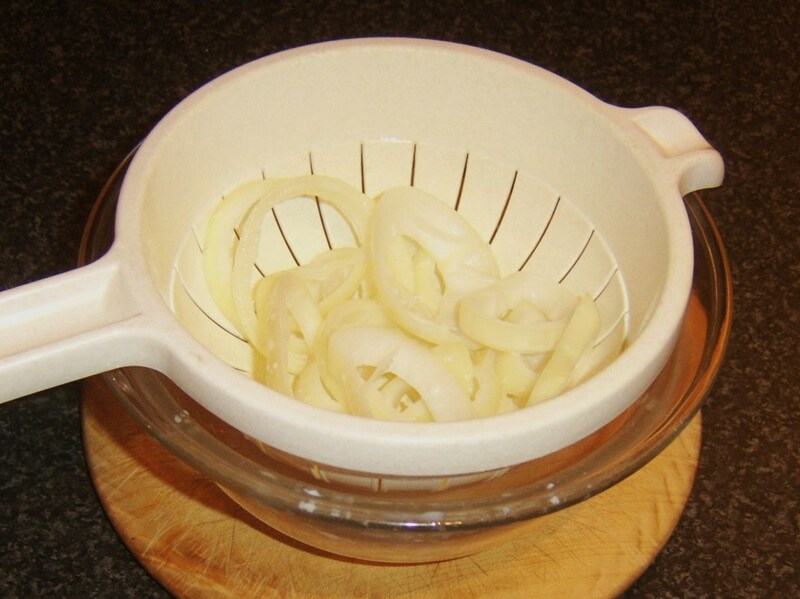 Drain the onion rings through a colander. 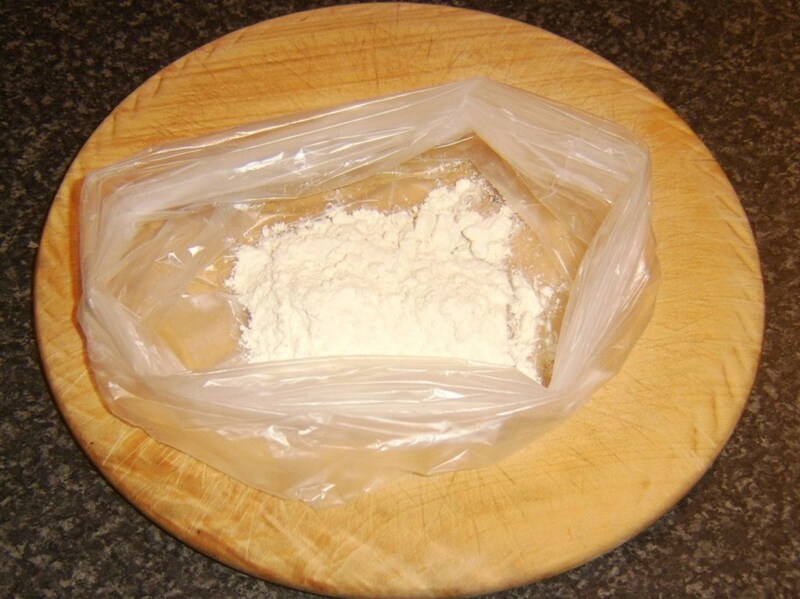 Add the remaining tablespoon of flour to a plastic bag and season with salt and pepper. Add the onion rings and twist the bag closed, trapping as much air in it as possible. Invert several times and very gently shake to coat the onions evenly in the flour (don't shake too hard or you may break some of the rings). The egg white and yolk have to be separated. The simple device in the relevant photo above is perfect for this purpose. 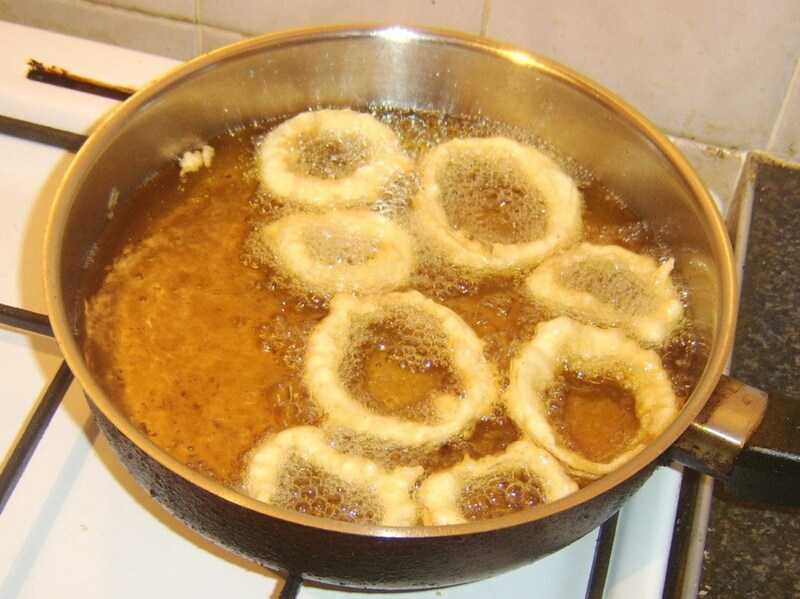 Start both your (dry) griddle pan and the oil for frying the onion rings heating. 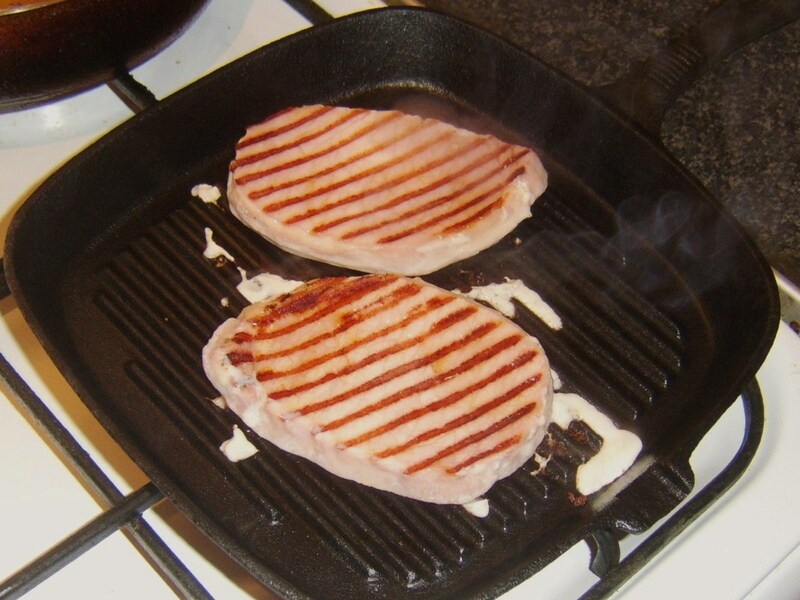 Use a pastry brush to lightly coat the bacon steaks on one side with vegetable oil before laying them oiled side down in the griddle pan. 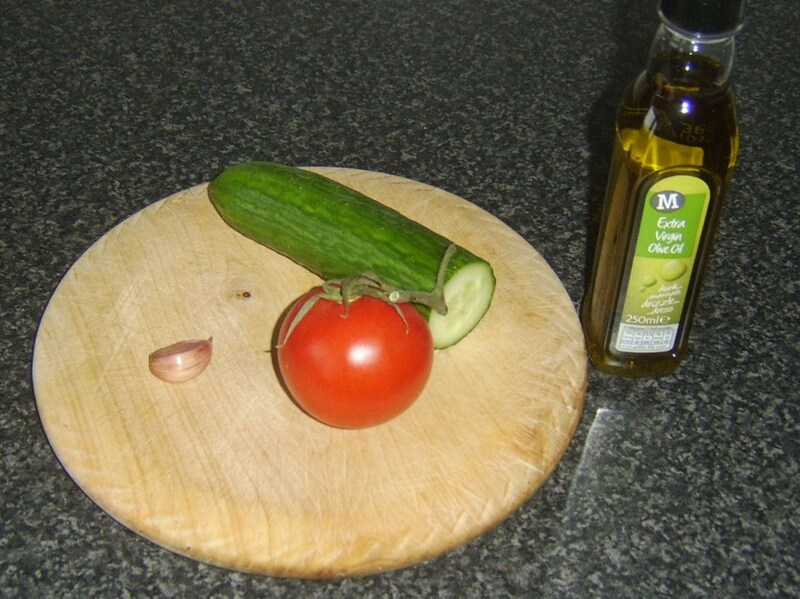 Never use olive oil for this purpose - it will burn and turn the meat bitter. Leave them alone to cook for a couple of minutes. 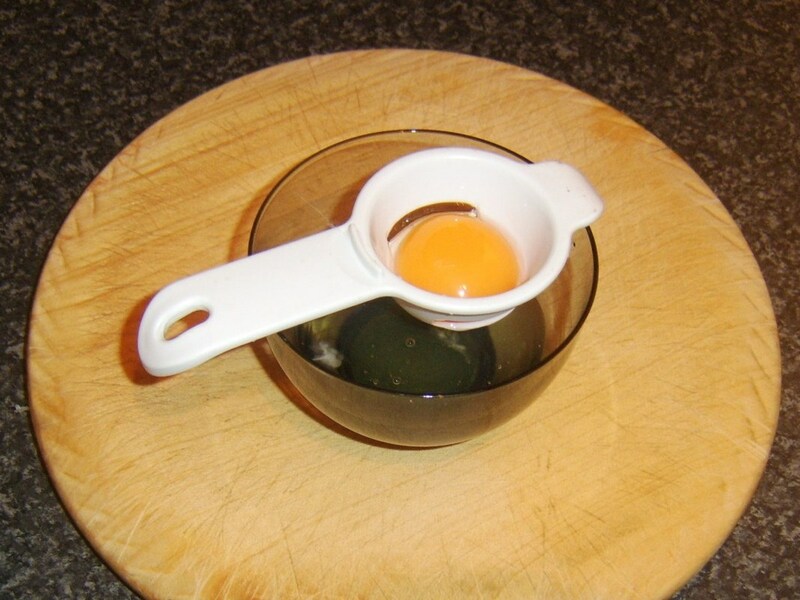 Oil the upper side immediately before carefully turning with cooking tongs to similarly cook on the second side. 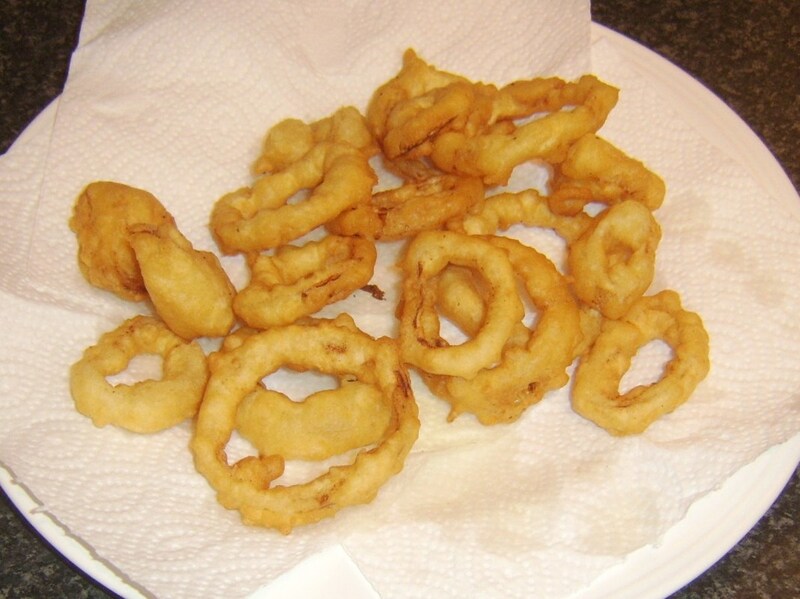 Take the onion rings from the flour and add to the batter. 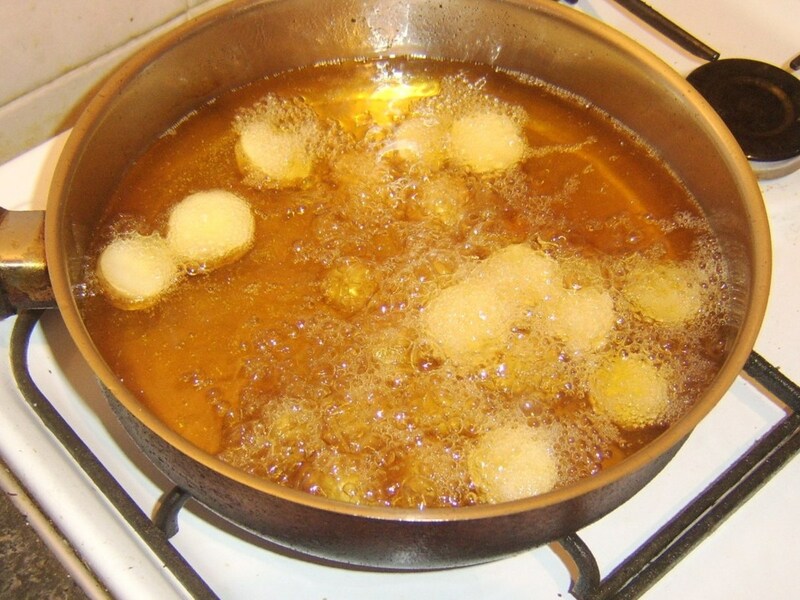 Carefully stir around with your hand before lifting one at a time in to the hot oil. 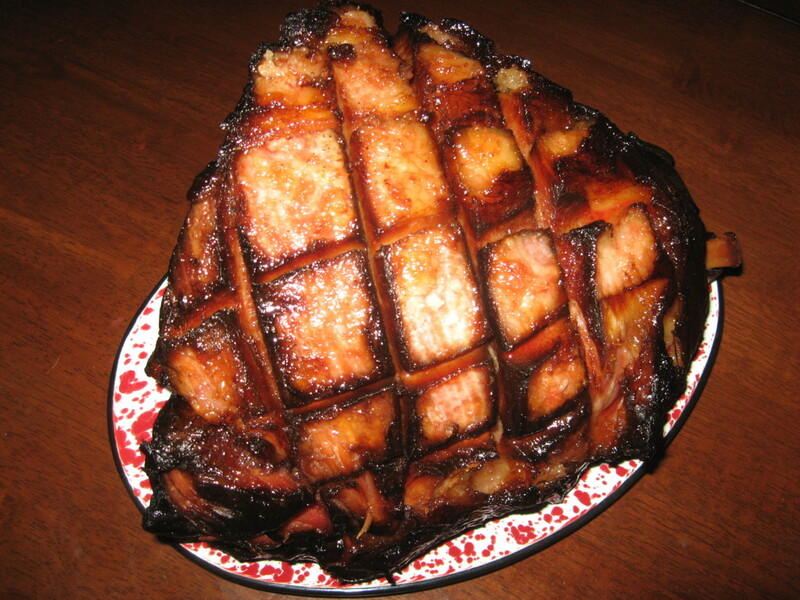 Deep fry for around three or four minutes until crisp. Drain on kitchen paper. 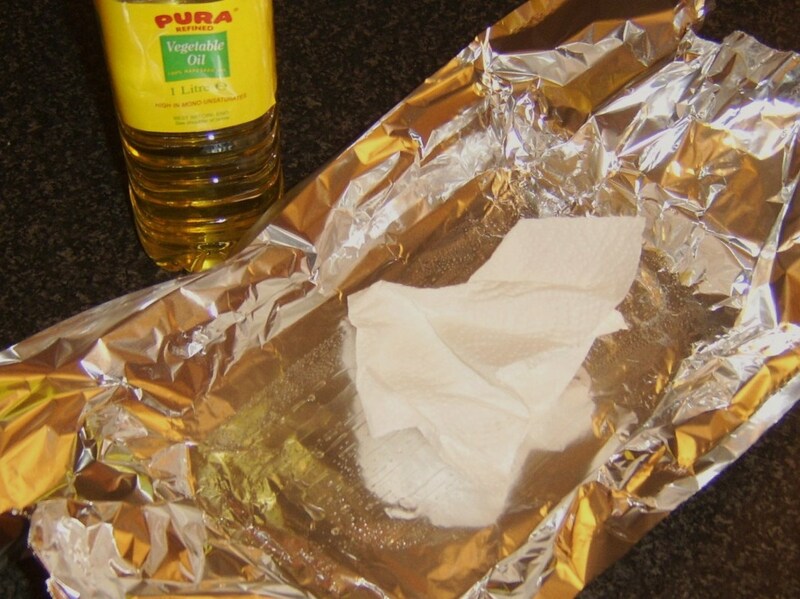 Wipe a small frying pan with oil and bring up to a medium heat. Pour in the egg white. 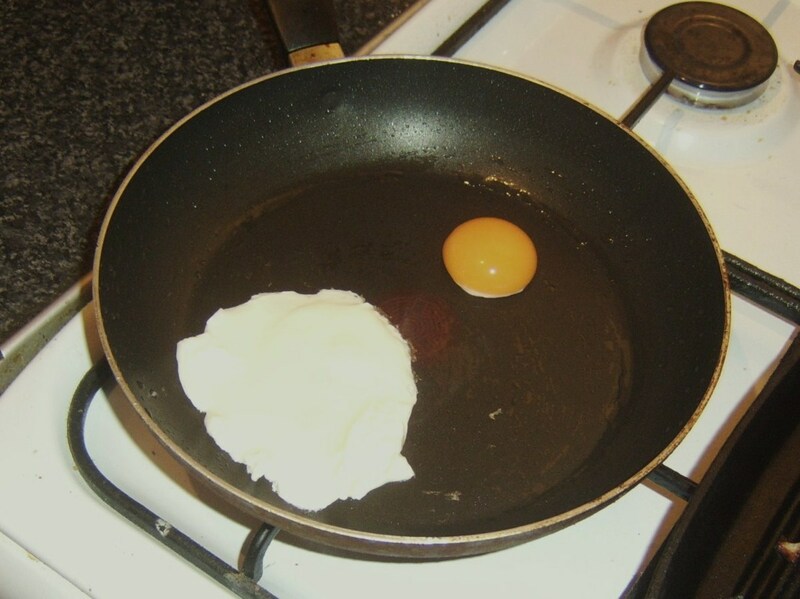 Reduce the heat after a few seconds and add the yolk after about a minute. Cook both for a further couple of minutes until the white is completely set. 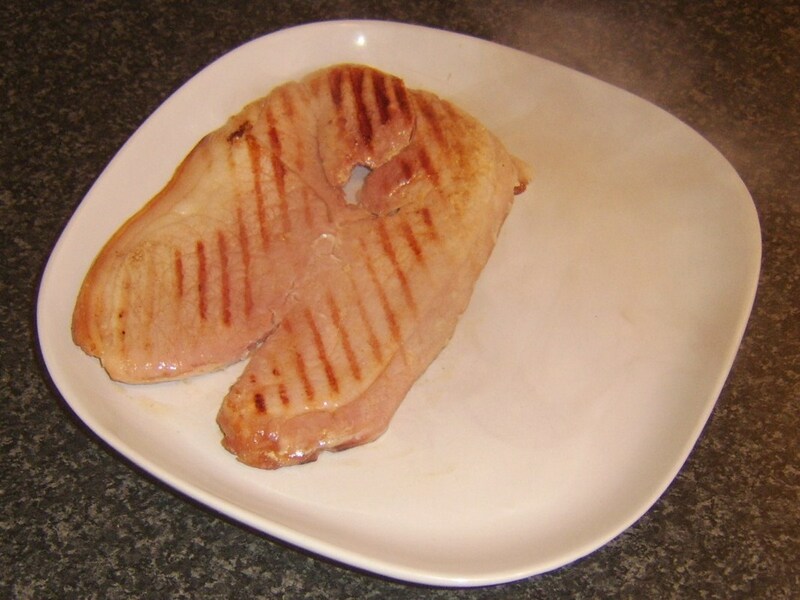 Lift the griddled bacon steaks to a serving plate. 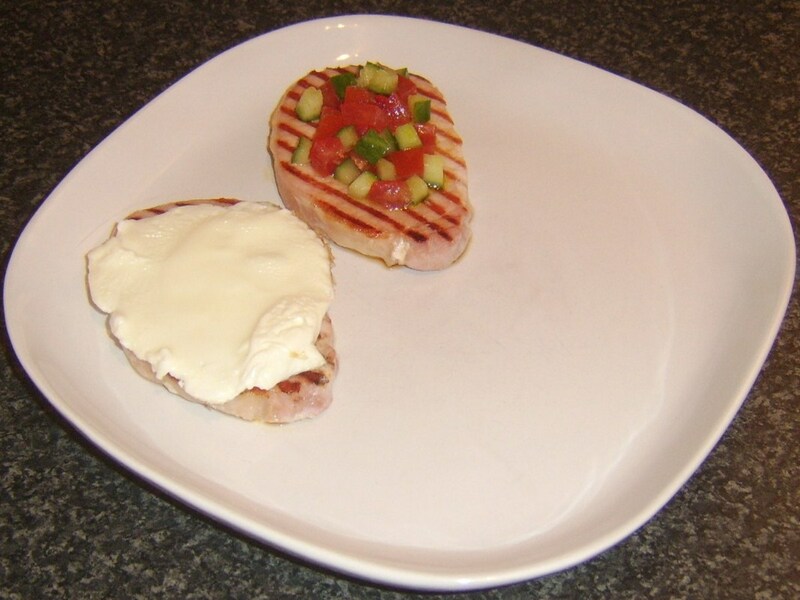 Lay the egg white on top of one of them and spread salsa carefully over the other. Add a little salsa to the top of the egg white to resemble an egg yolk in size and shape. Add the egg yolk to the centre of the salsa bed on the second steak. 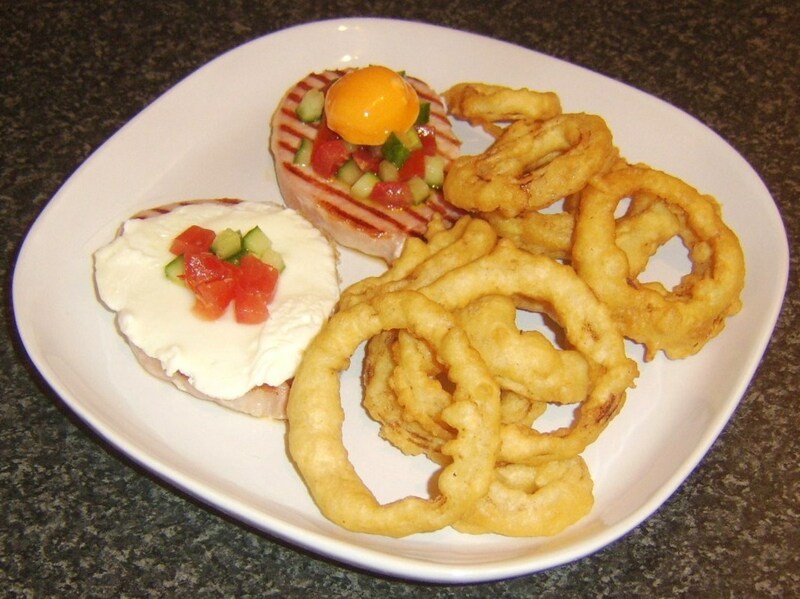 Plate the onion rings alongside to serve. 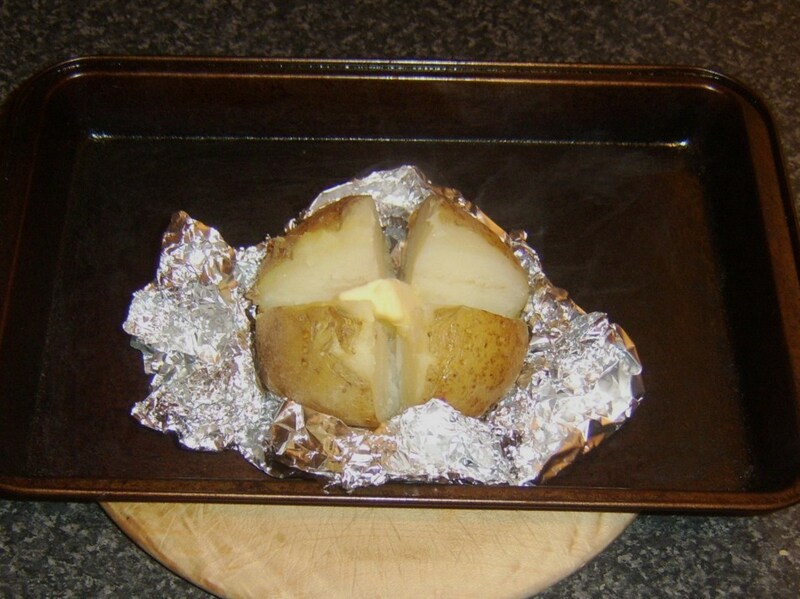 Wash the baked potato thoroughly and pat dry with kitchen paper. Take a metal (must be metal and never wood!) skewer and force it through the centre of the potato lengthways. 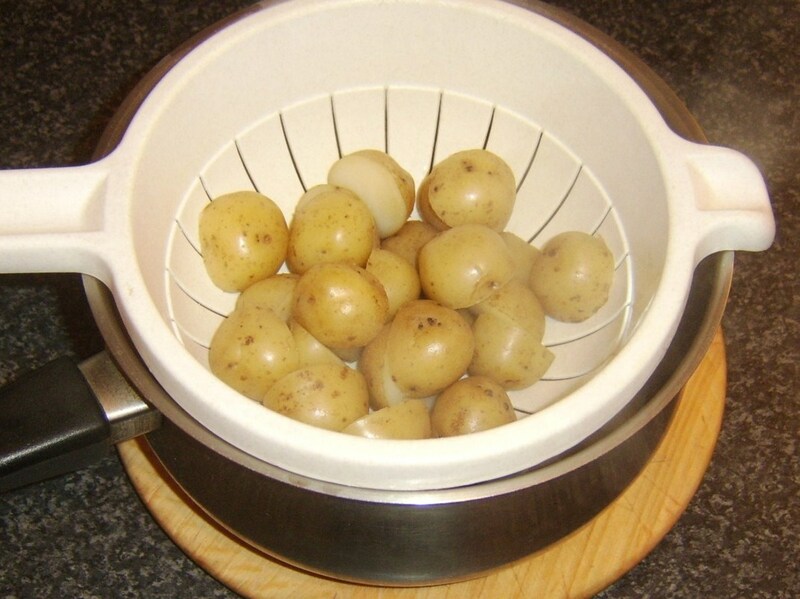 This serves to conduct the heat through the potato, cooking it evenly, eliminating the risk of that ghastly hard centre when the rest of the potato is cooked to perfection. 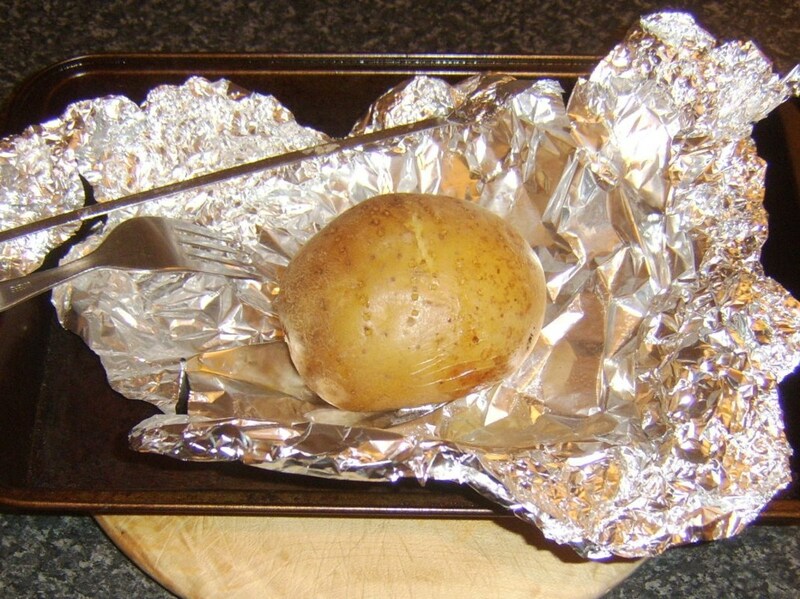 Pierce the potato several times with a fork to allow steam to escape and prevent it bursting during cooking. 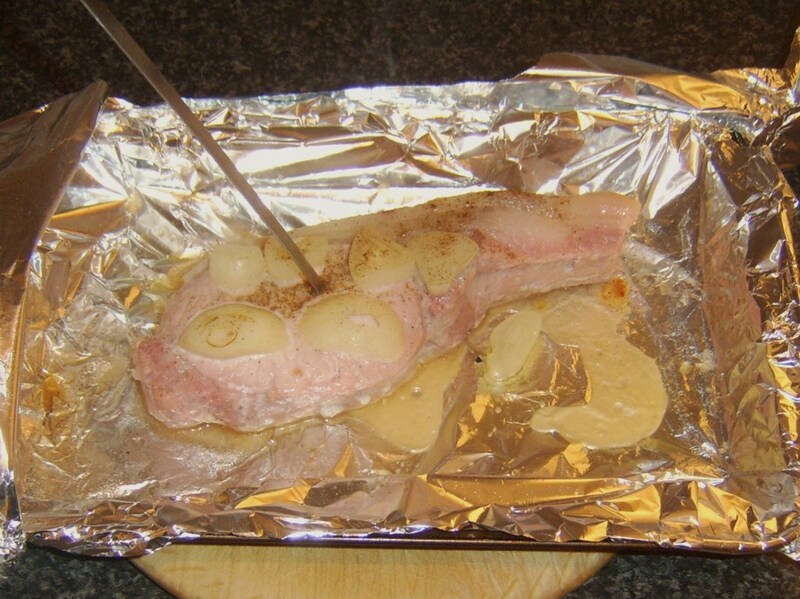 Lightly oil a large sheet of tinfoil to prevent the potato sticking. 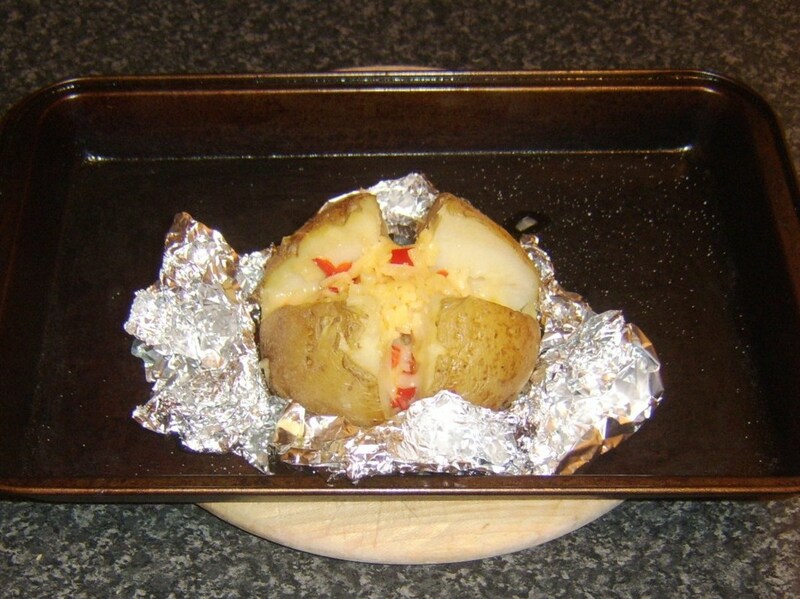 Sit the potato on the foil and wrap in to a loose but sealed tent. 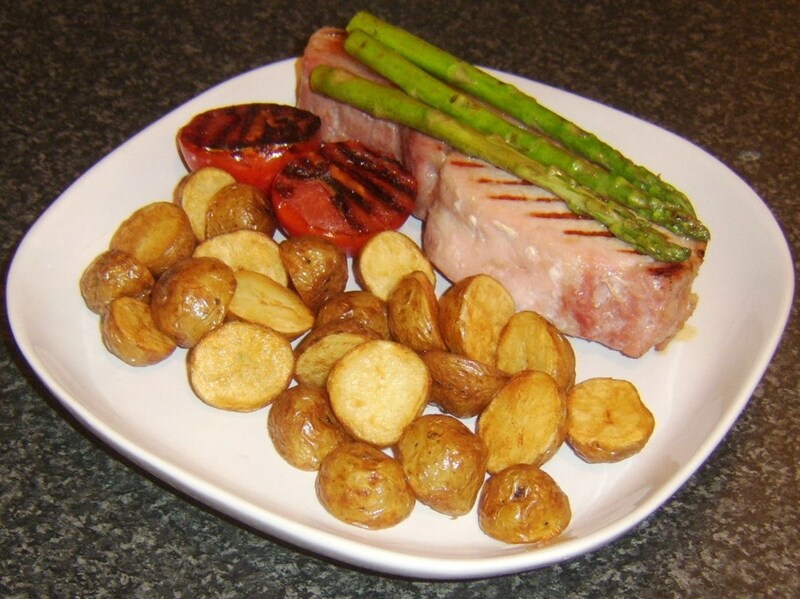 Sit on a baking sheet or tray and bake for one and a half hours. Take the potato from the oven. 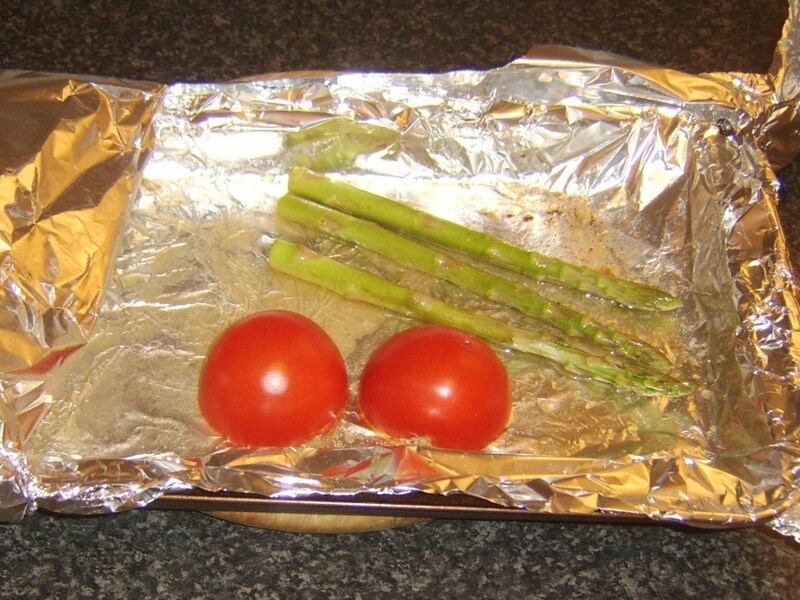 Remember everything will be hot, including the foil and the skewer so wear oven gloves at all times. 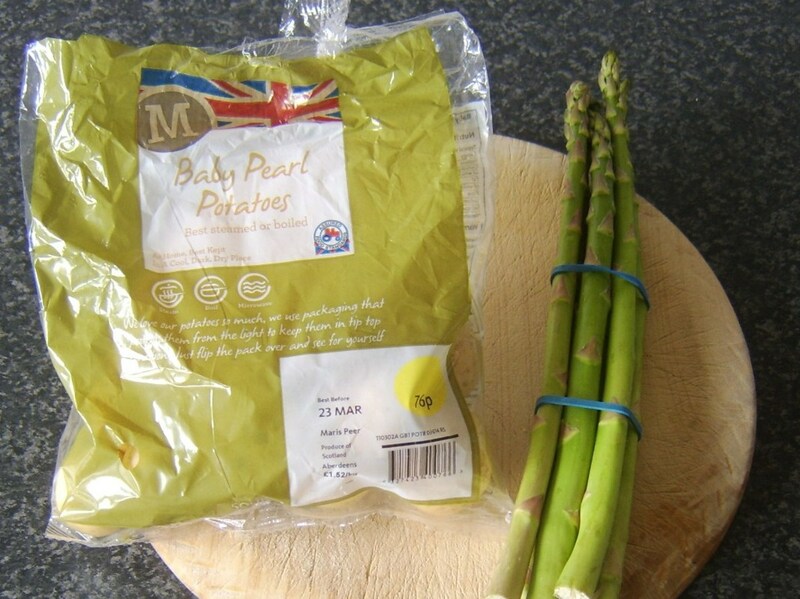 Carefully unwrap the potato and pull the skewer gently but steadily free, holding the potato with a fork. 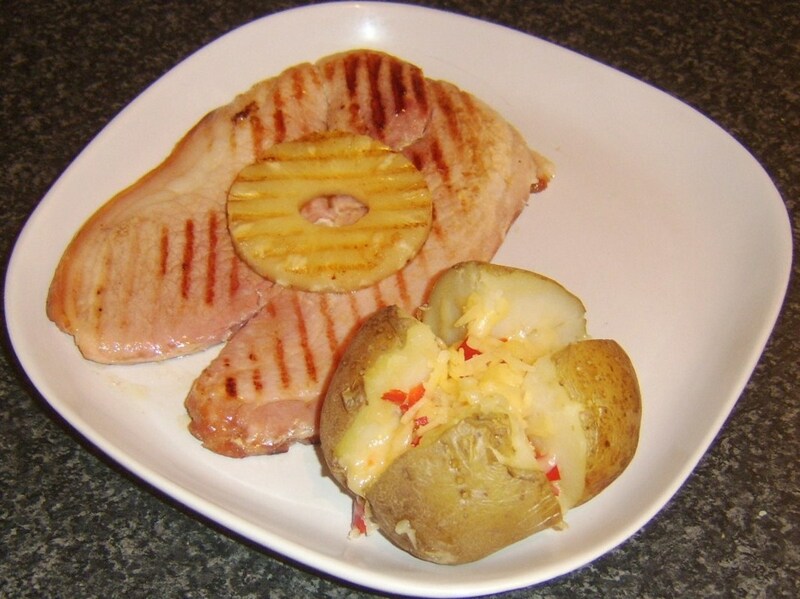 If your potato is cooked, it will easily come out clean. 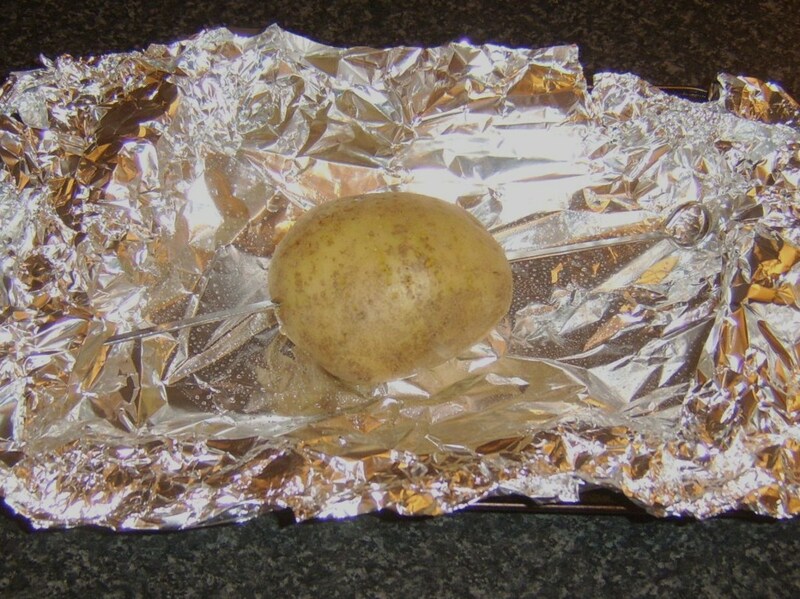 Scrunch the foil around the lower part of the potato like a nest. 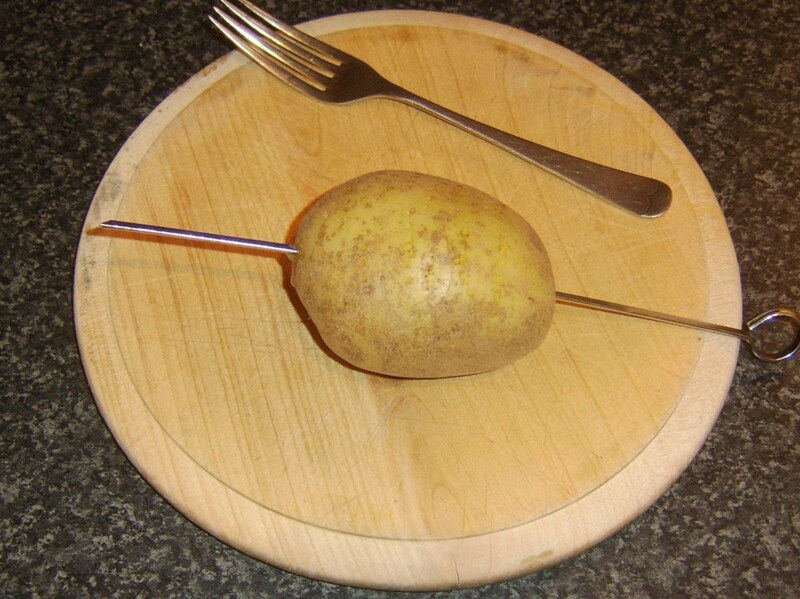 This is going to stop the potato potentially falling apart when you cut it. 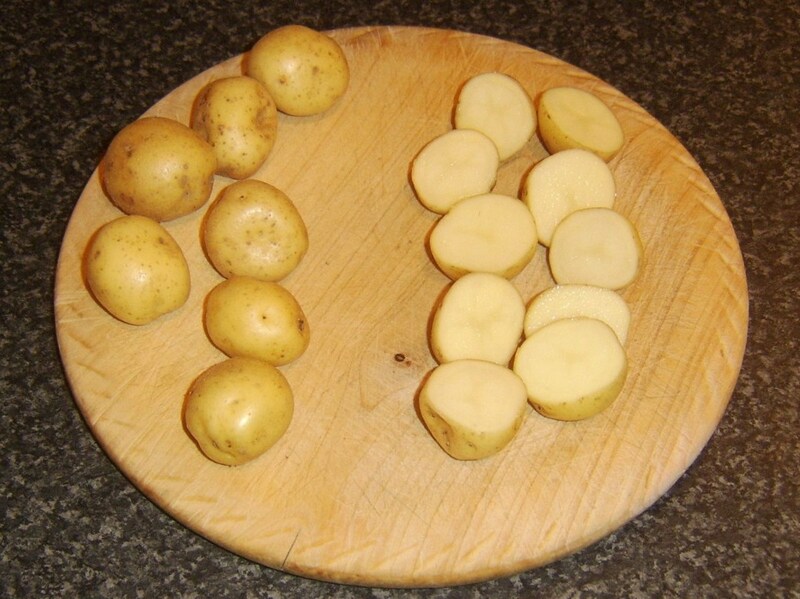 Cut the potato across the way and lengthways two-thirds of the way through. Add a little bit of butter. 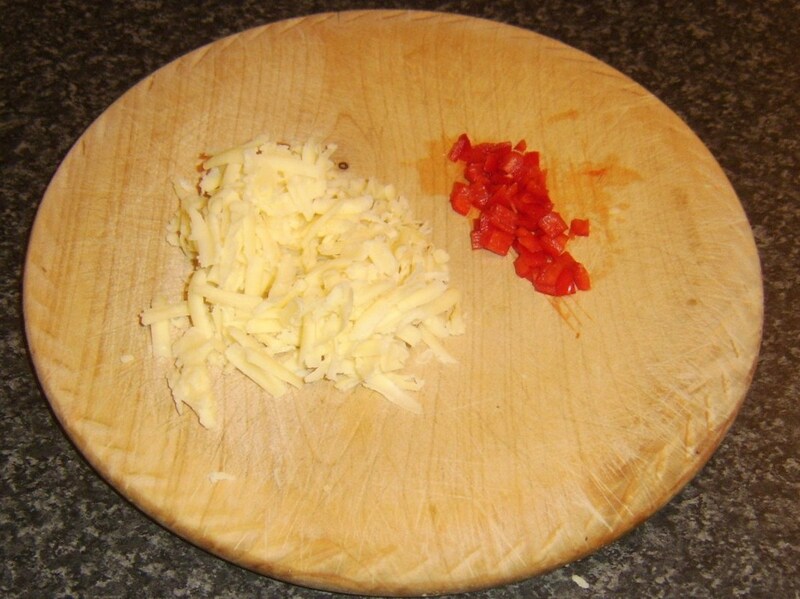 Mix the cheese with the chilli and use to fill the potato. 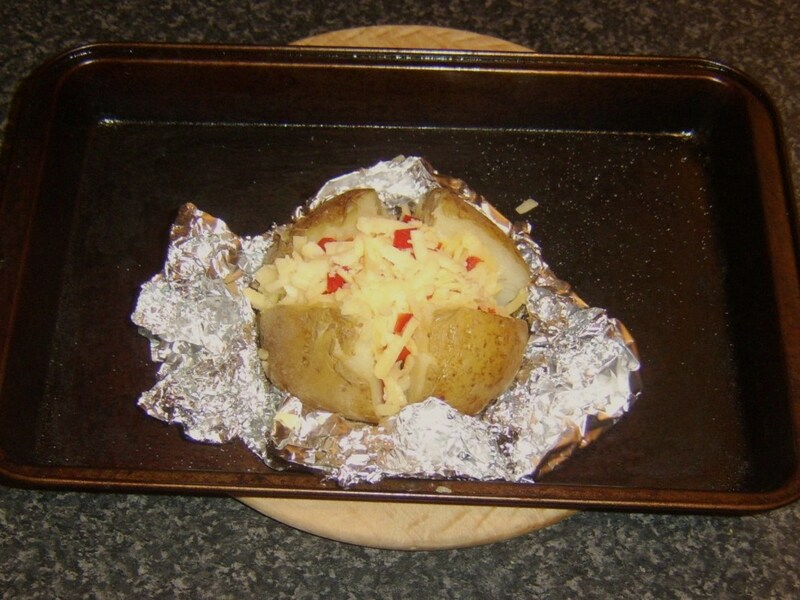 Return to the switched off oven and allow the residual heat to help melt the cheese/keep the potato warm while you prepare the rest of the meal. 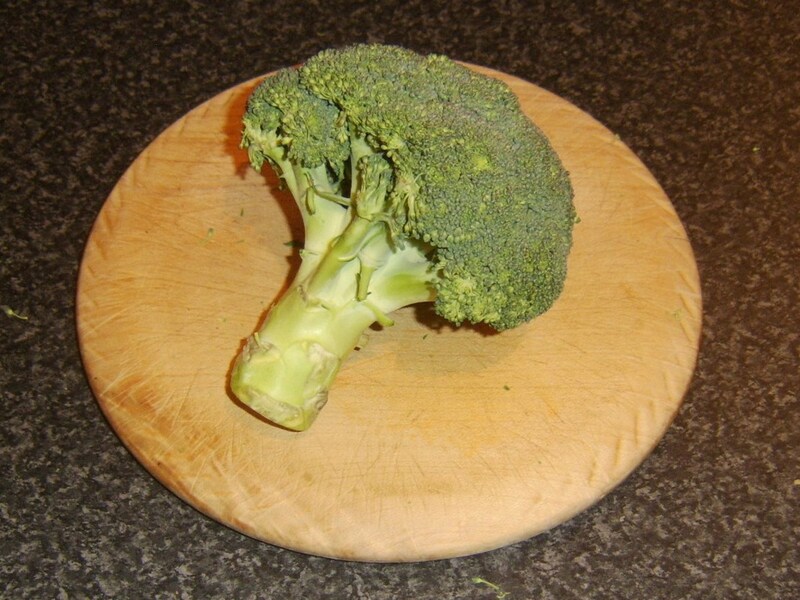 Put the broccoli florets in to a large pot. Season with salt and pour in plenty of boiling water. 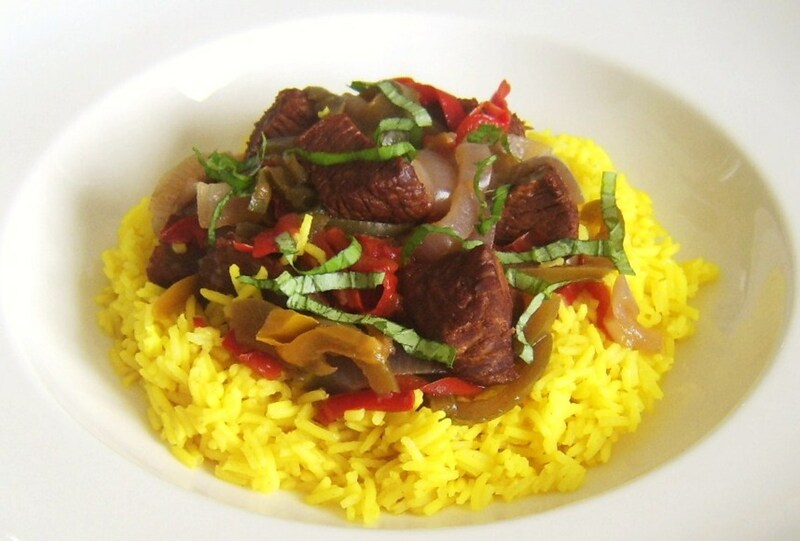 Put on to the stove and bring to a simmer for six to eight minutes until just softened. 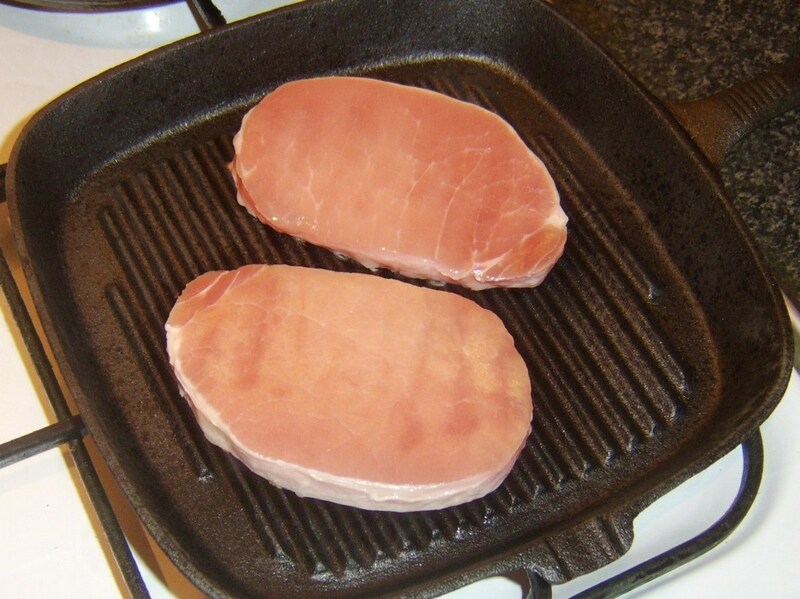 Bring your griddle up to a high heat. 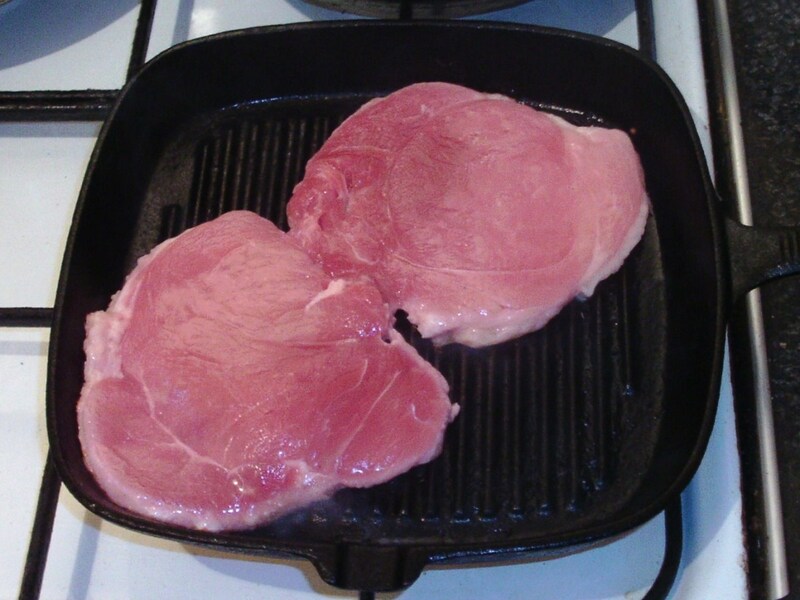 Lightly oil the gammon steak and fry for around a minute and a half to two minutes each side until cooked. Lift to a plate. 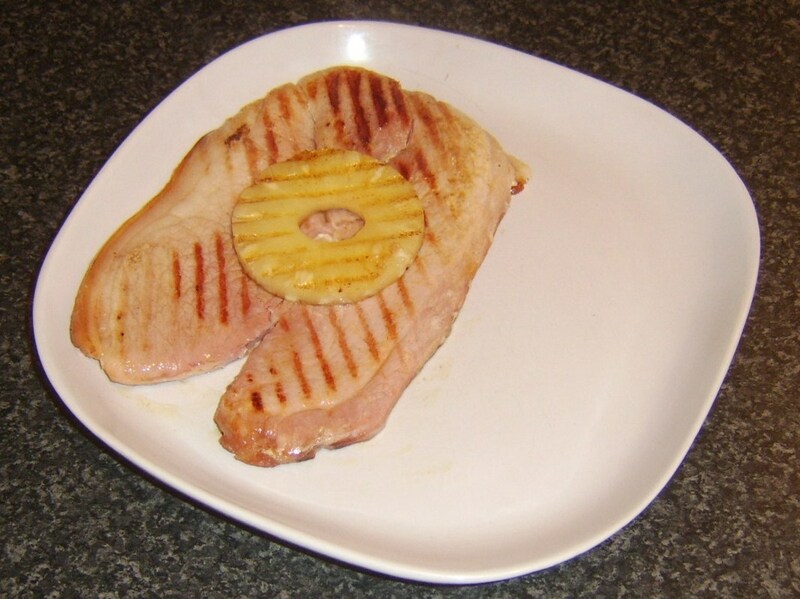 The pineapple ring should be oiled and griddled for around twenty seconds each side before being lifted on to the gammon steak. 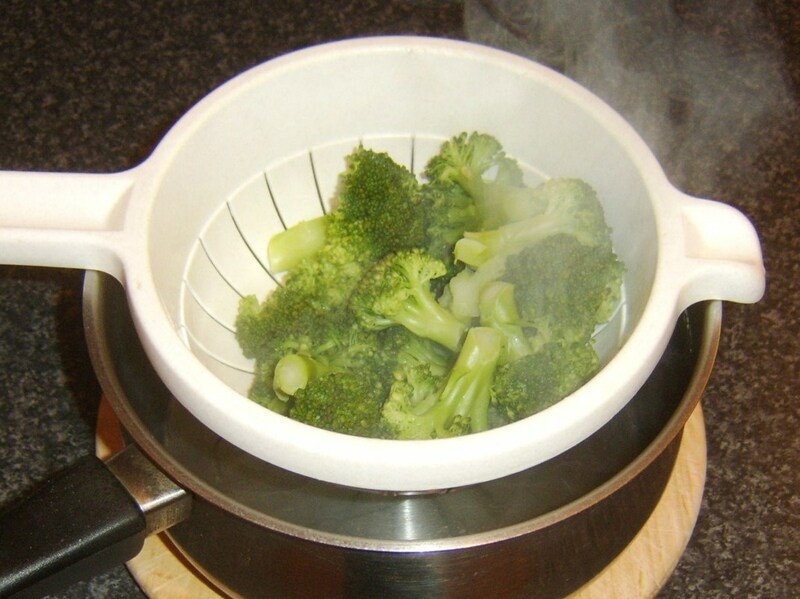 Drain the broccoli thoroughly through a colander. 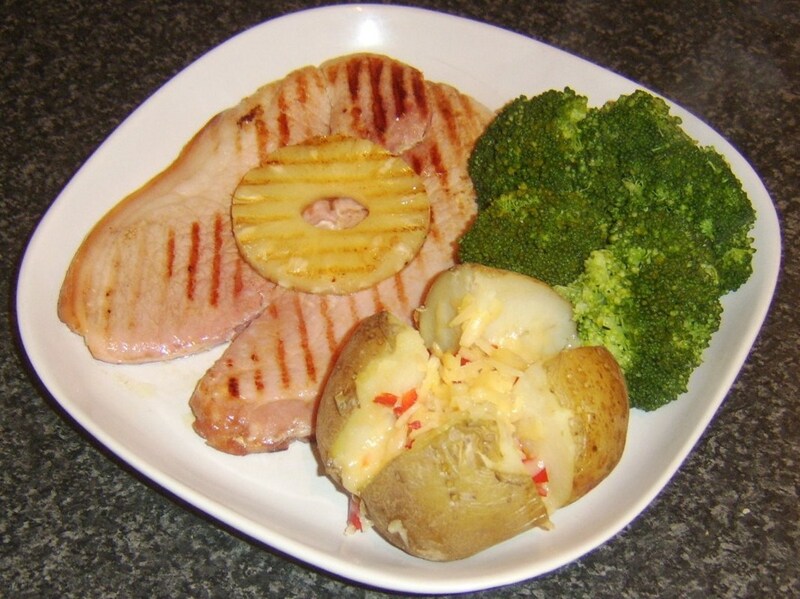 Take the potato from the oven, ease away the foil and lift on to the plate beside the gammon steak. 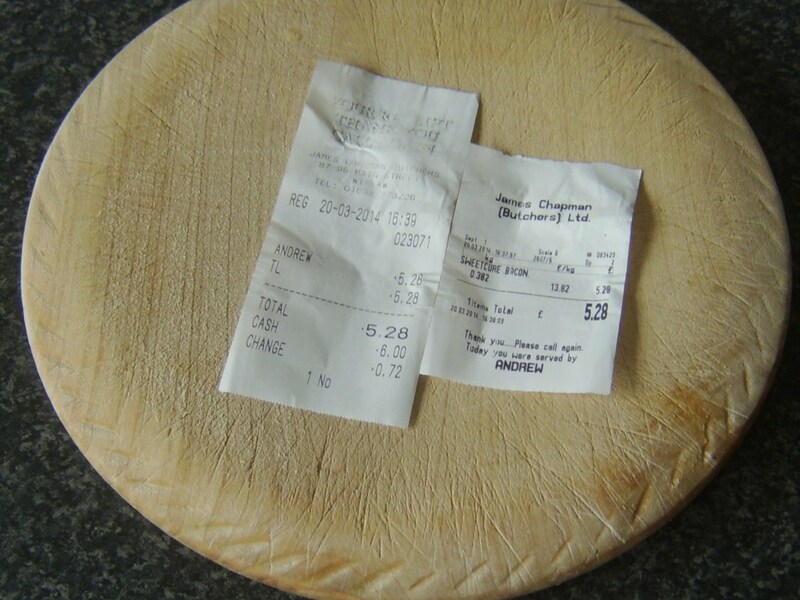 You will find the melted cheese now serves effectively as a glue, preventing any one or more corners falling unceremoniously flat and spoiling presentation. 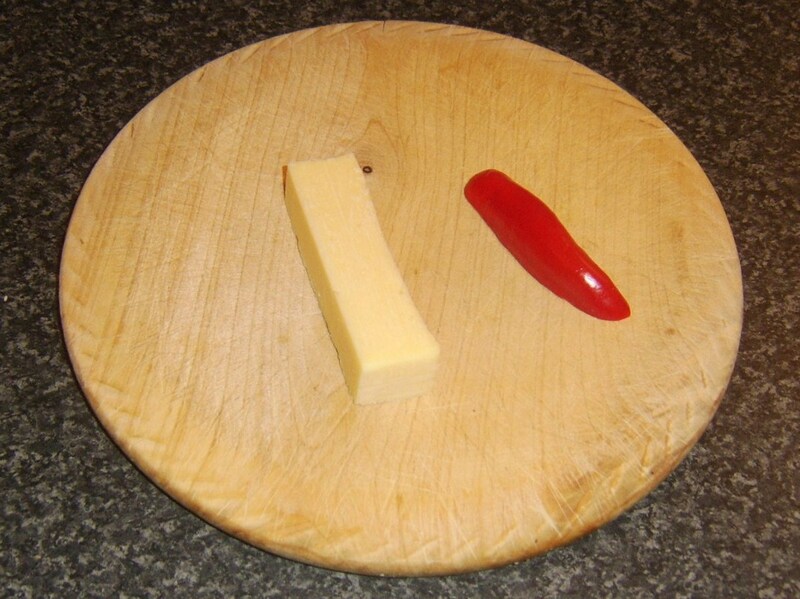 Plate the brocooli last of all and enjoy your meal. 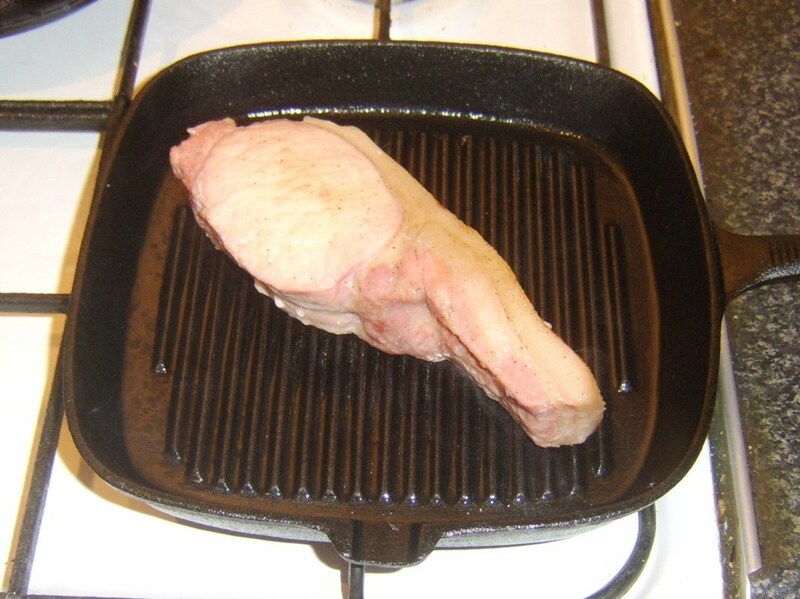 Do you ever cook your steaks on a griddle pan? 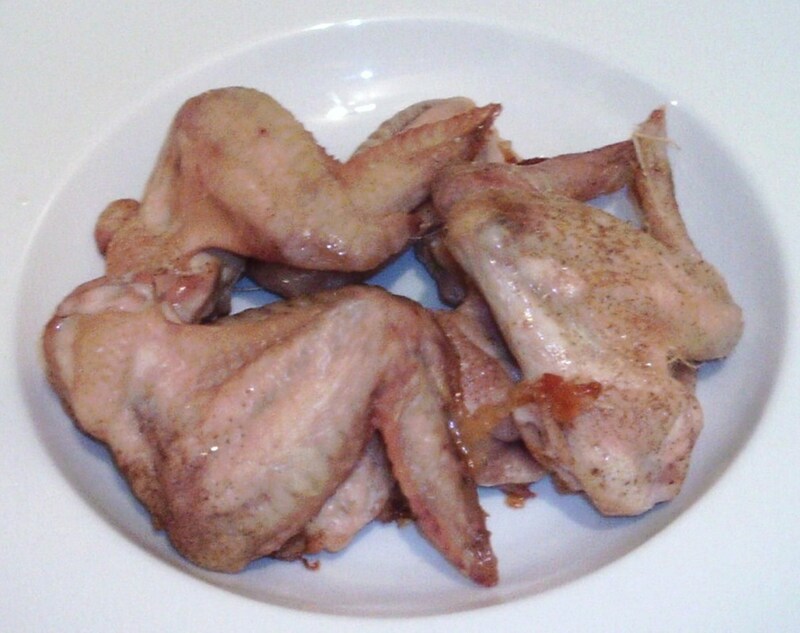 Rub the chicken wings all over with oil and season with salt and pepper. 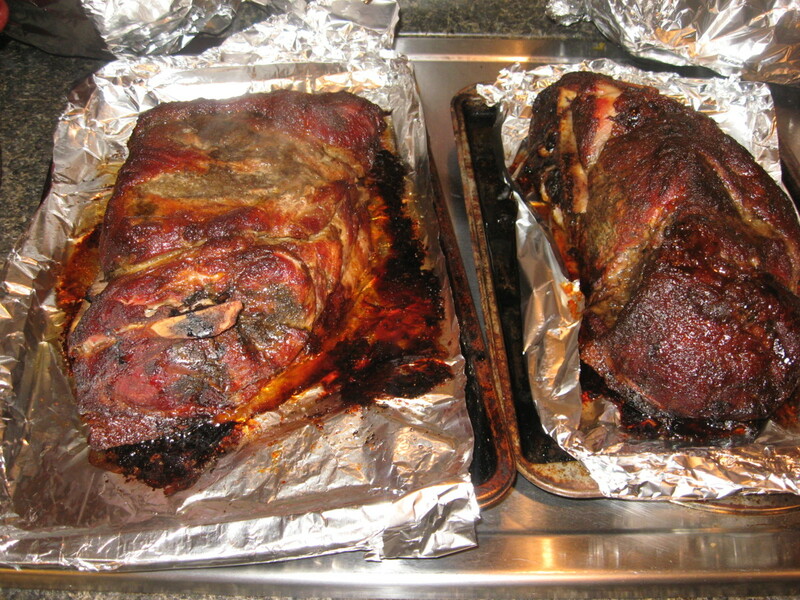 Lay them skin sides up on a roasting tray and cook in the oven for 30 to 35 minutes. 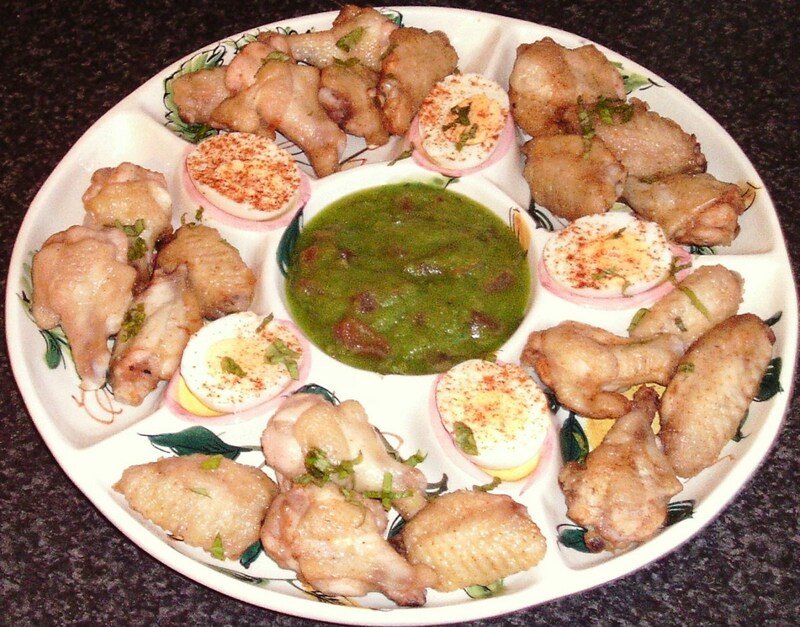 Remove the chicken wings from the oven and leave them for about 15 minutes until they are cool enough to handle. Peel the skin off the chicken wings and discard. 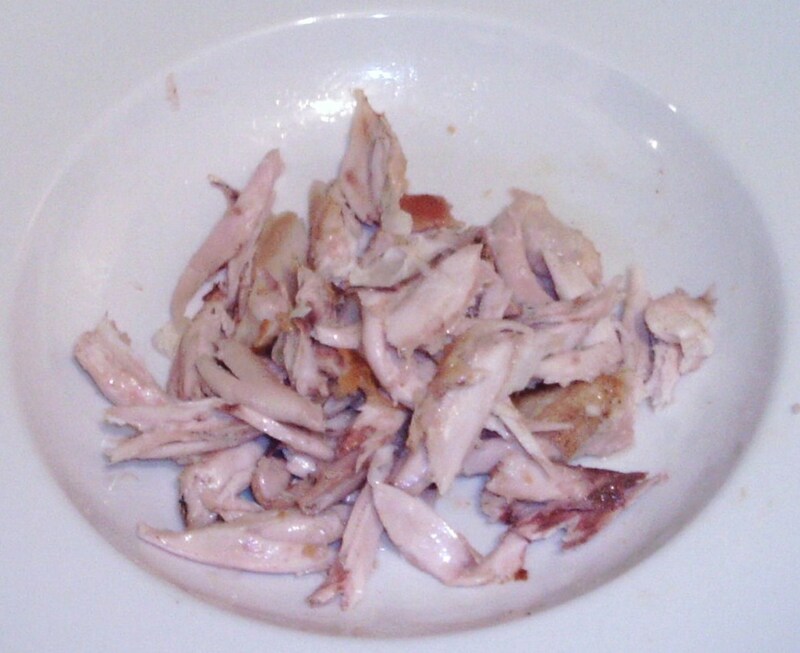 Pluck the meat from the bones and discard the bones. 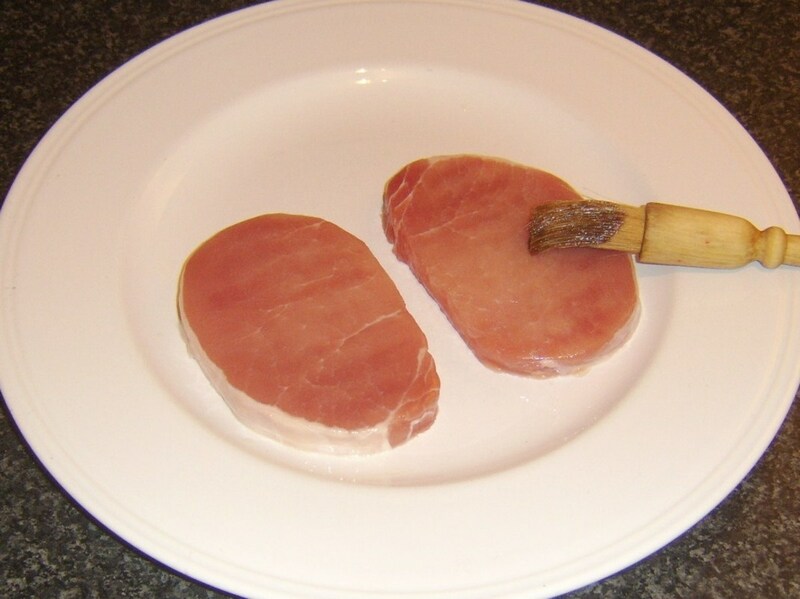 Bring your griddle pan up to a smoking hot heat and oil both sides of the gammon steaks with a pastry brush. Fry for a couple of minutes each side until done. 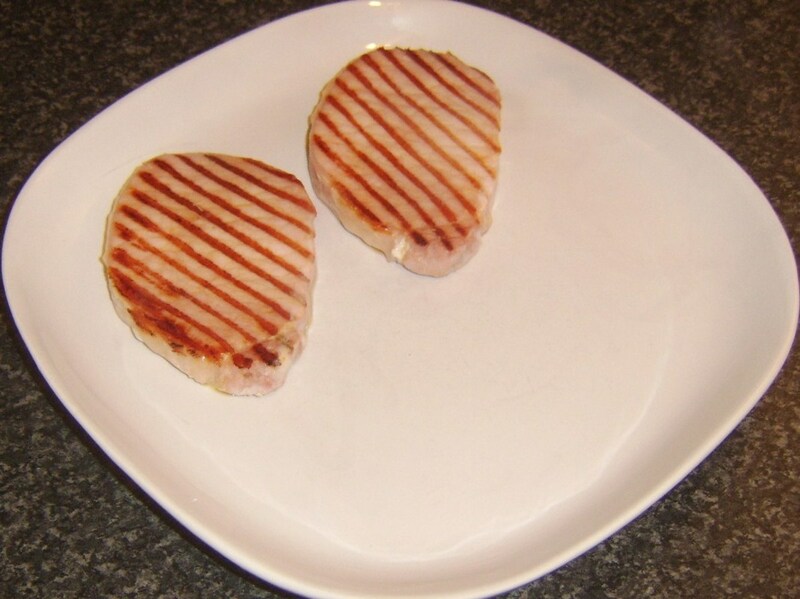 Lift the gammon steaks to a plate to rest for a few minutes. 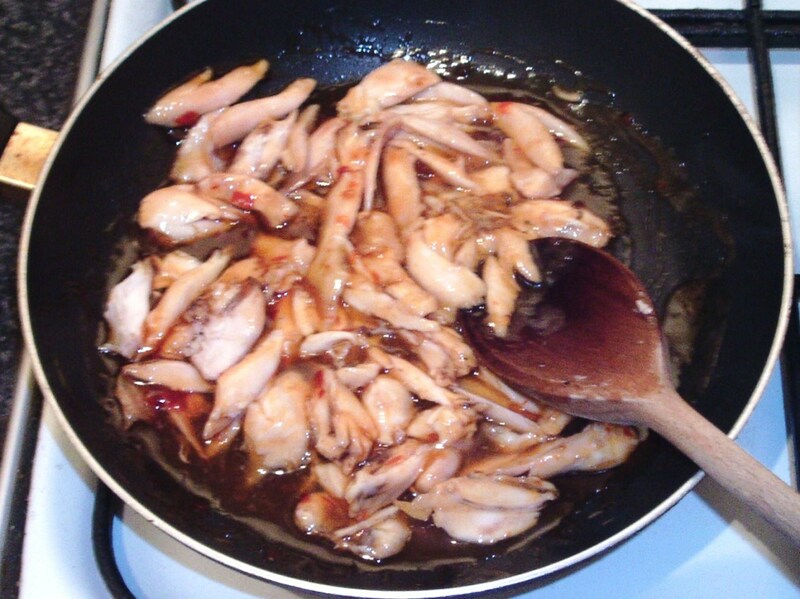 Pour the sweet chilli sauce in to a small frying pan and put it on to a medium heat. 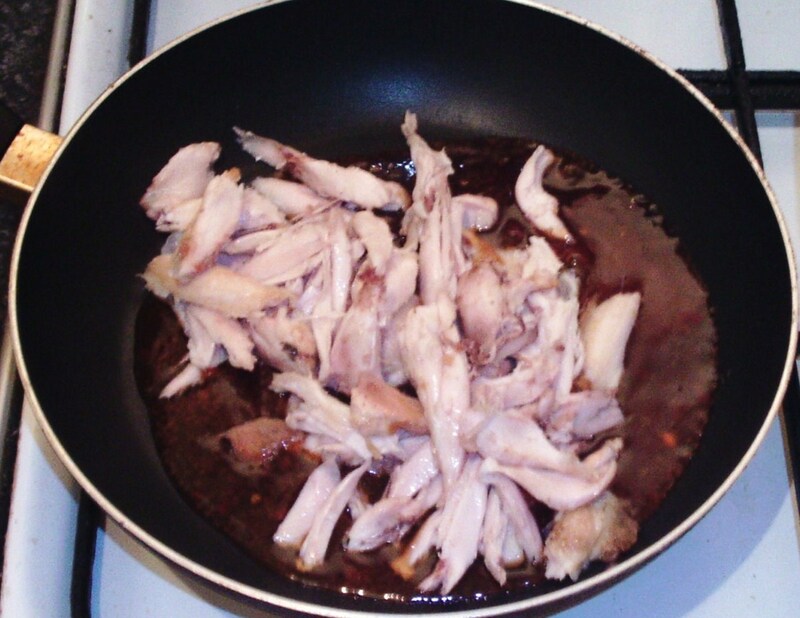 Add the meat from the chicken wings and stir fry for 3 or 4 minutes to ensure the chicken is fully reheated. 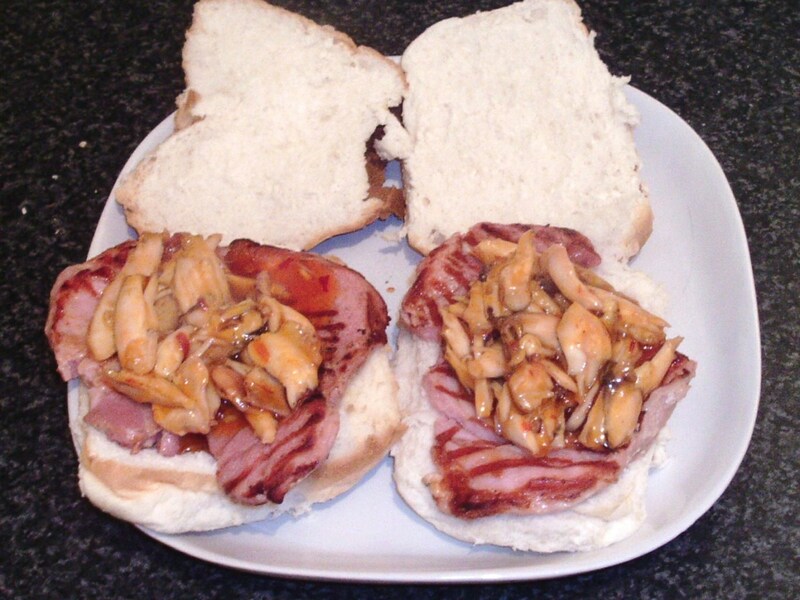 Cut the bread rolls open and lay the gammon steaks on the bottom half, followed by the chicken wings meat. 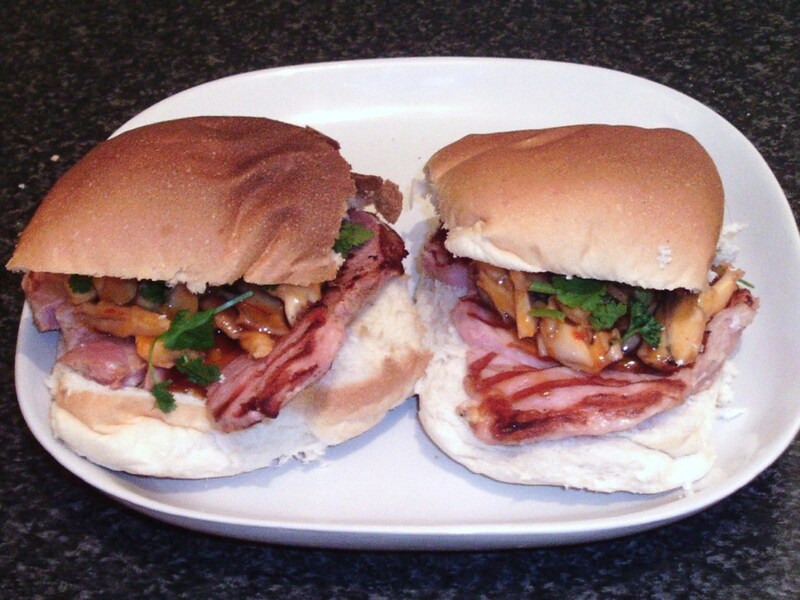 Finish with the coriander/cilantro and close the rolls over to serve. 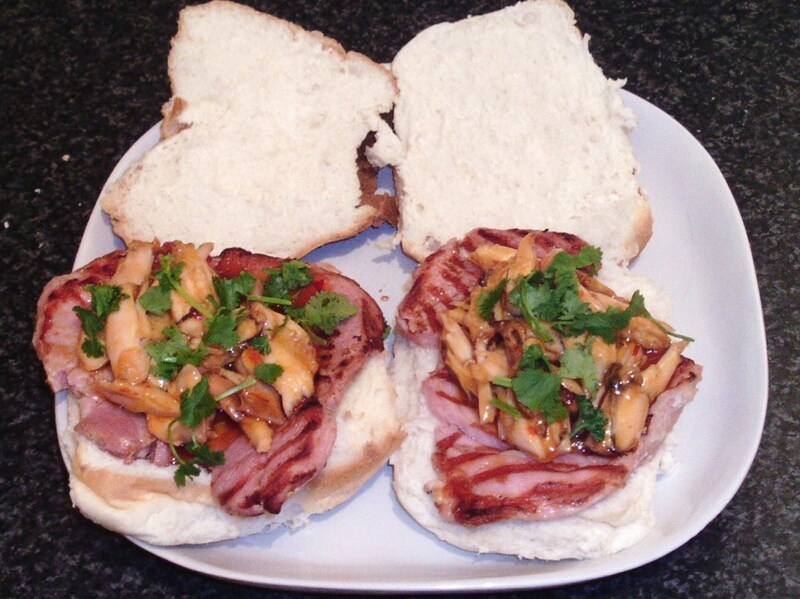 Back bacon is by far and away the most popular of the different types of bacon available in the UK. 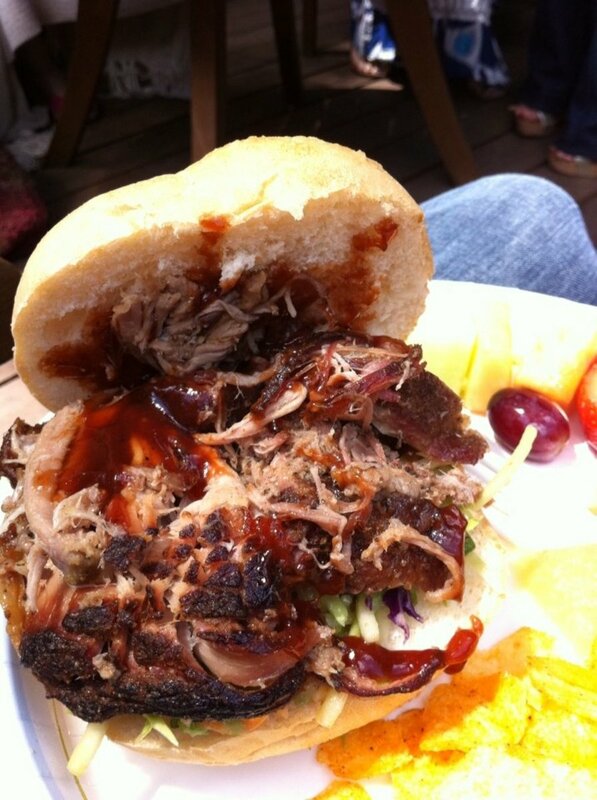 It can be bought both smoked and unsmoked. 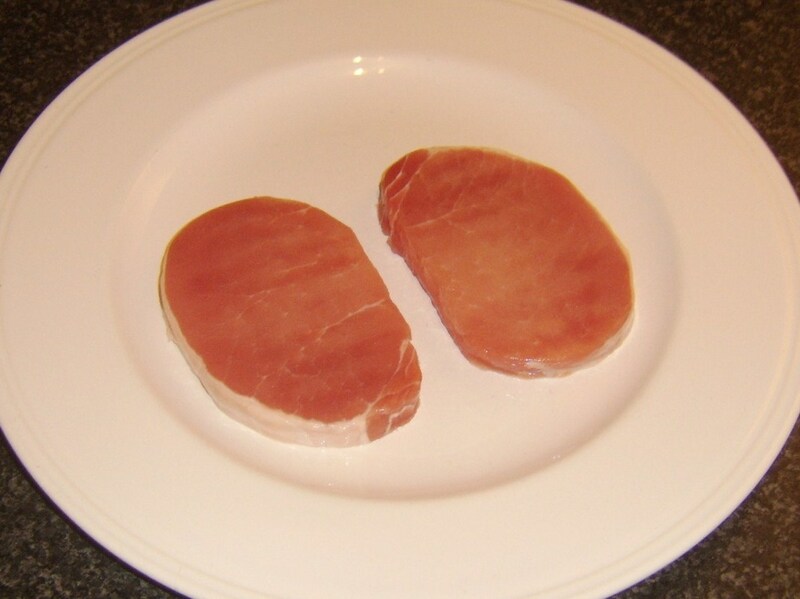 It is not usual however to see it in butchers' shops or supermarkets in steak form like this - it is usually thinly sliced in to what are known as rashers. 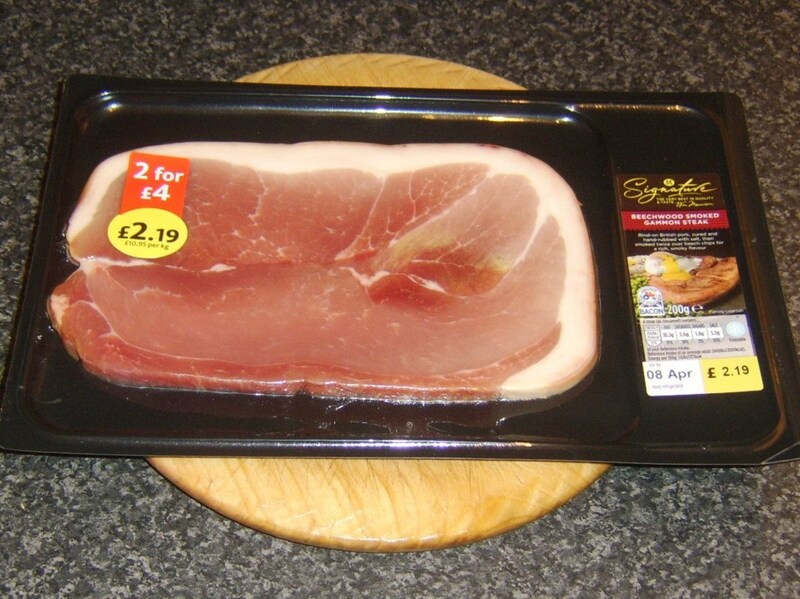 So where did I get this sweetcured (unsmoked) bacon steak? 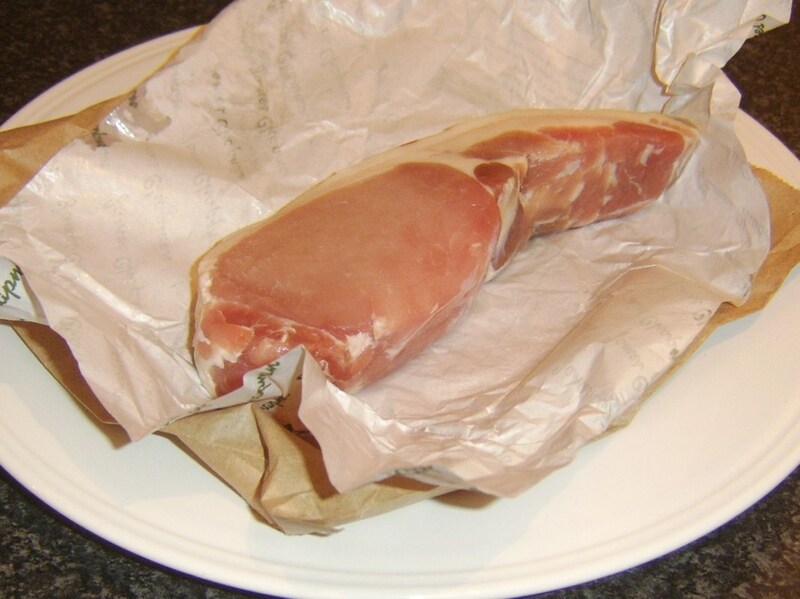 I simply went in to a local butcher's shop and explained what I wanted. 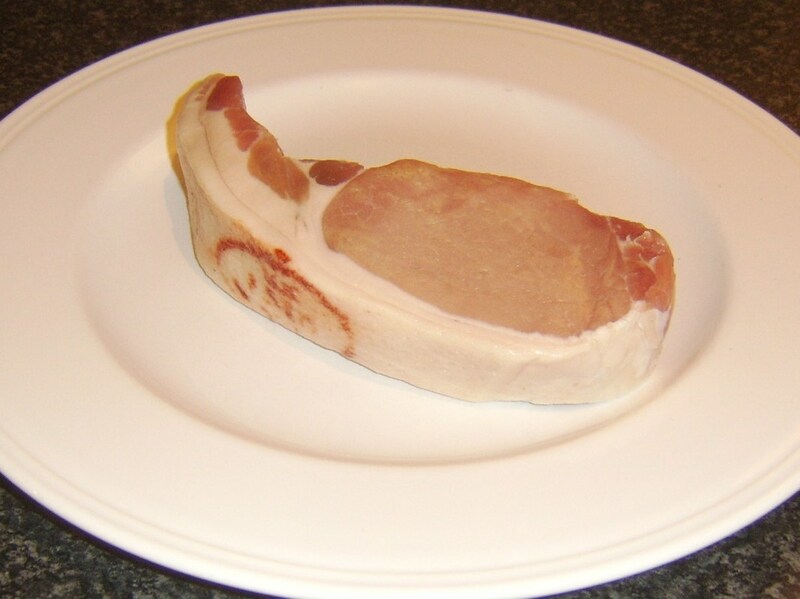 One of the butchers brought a large piece of sweetcured bacon meat and a large knife to the front shop and asked me to indicate how thick I wanted the slice. Job done, customer satisfied - perfect. 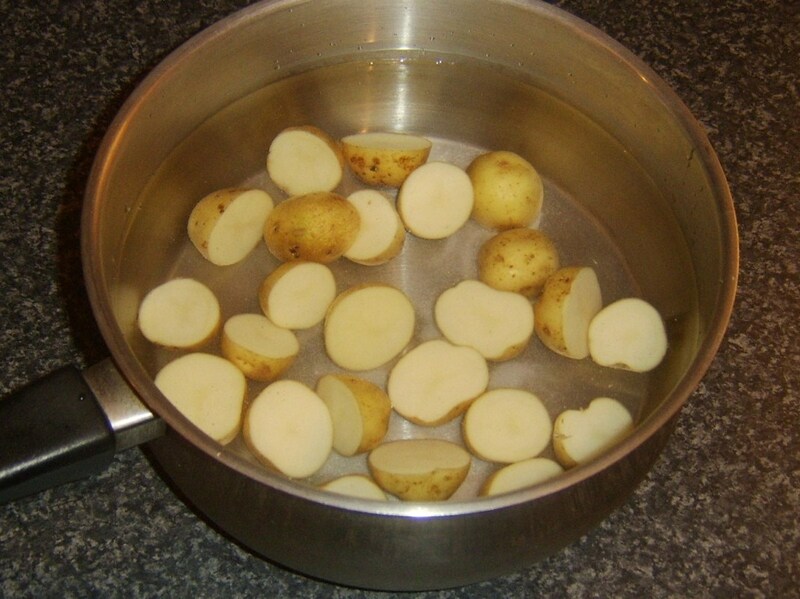 Put the potatoes in to a pot of cold salted water and bring the water to a simmer. Continue to simmer for around fifteen minutes, just until you see the skins starting to separate around the edges where the potatoes have been halved and no more. 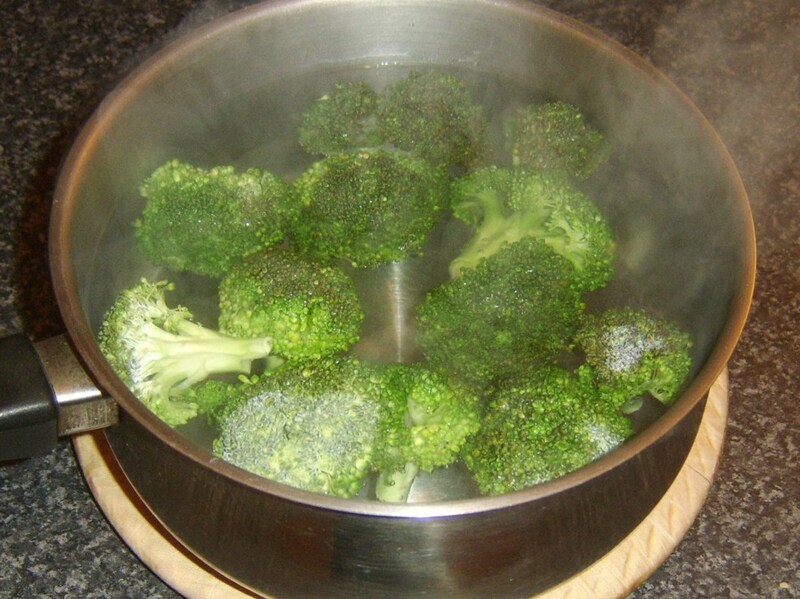 Drain well, return to the pot, cover and leave to cool completely (up to an hour). 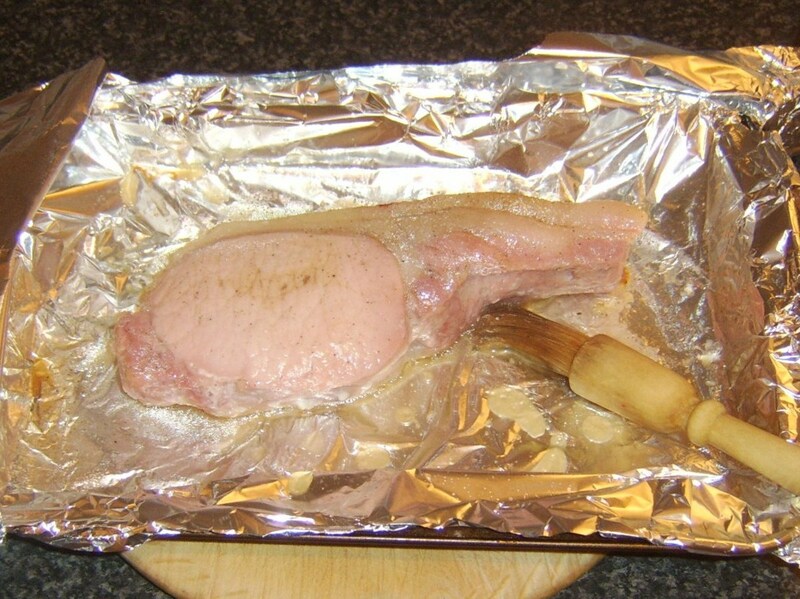 Preheat your oven to 190C/375F/Gas Mark 5. 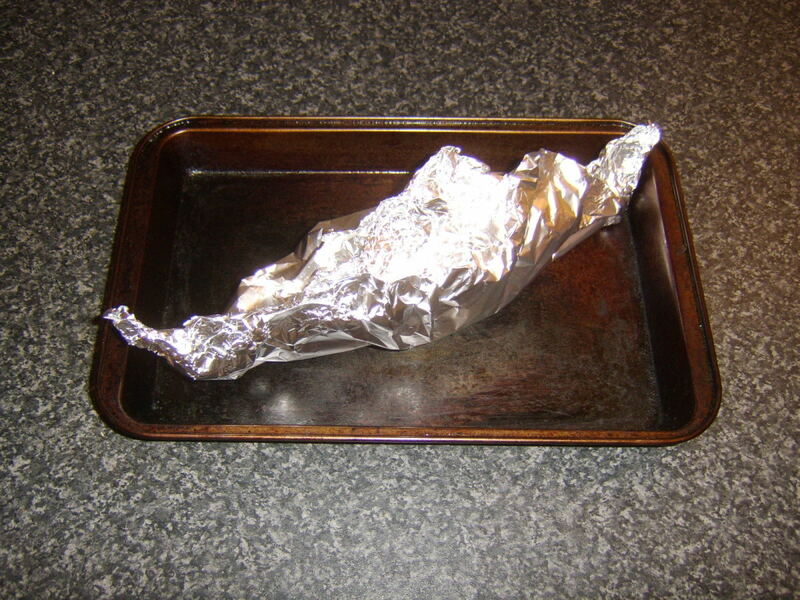 Lay a sheet of tinfoil on a roasting tray and lightly oil. 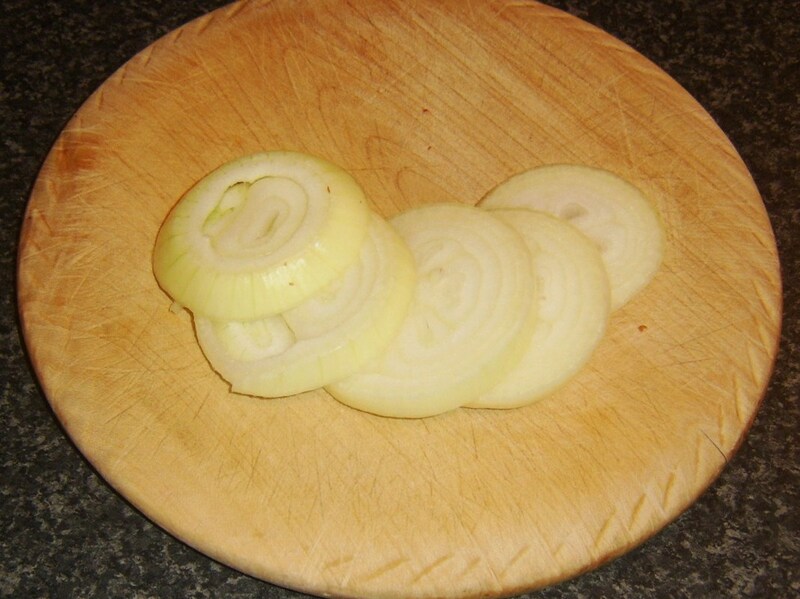 Sit the bacon steak in the centre, add the onion pieces and season with black pepper. 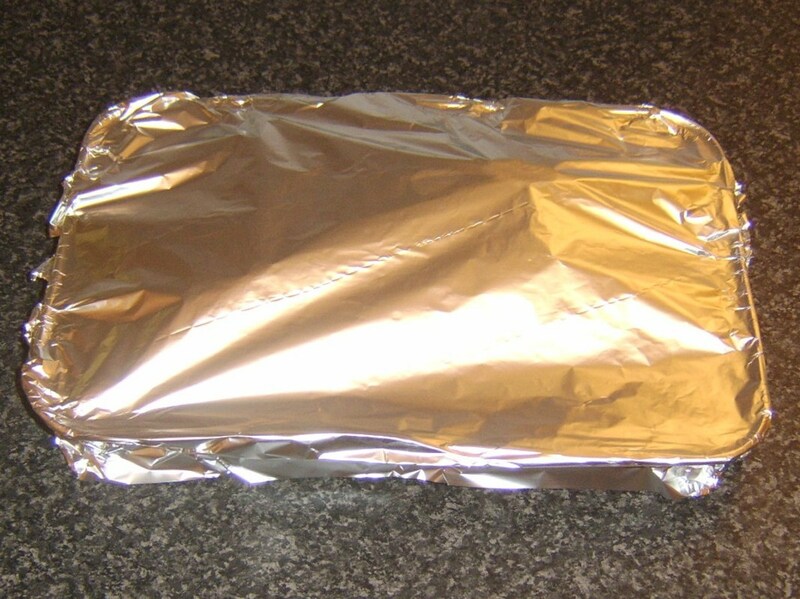 Wrap the foil over/add a second sheet to form a loose but sealed tent. Bake in the oven for twenty minutes. 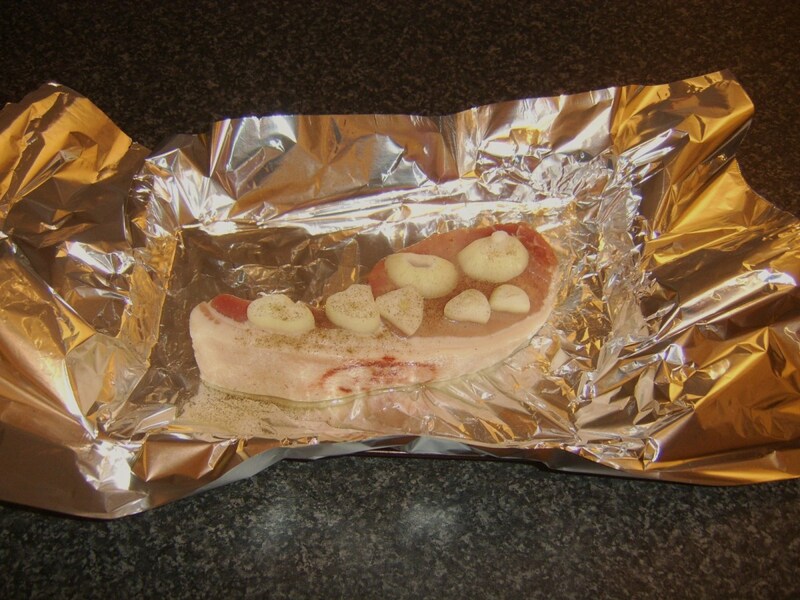 Take the bacon steak from the oven, carefully unwrap the foil and test with a metal skewer for doneness. 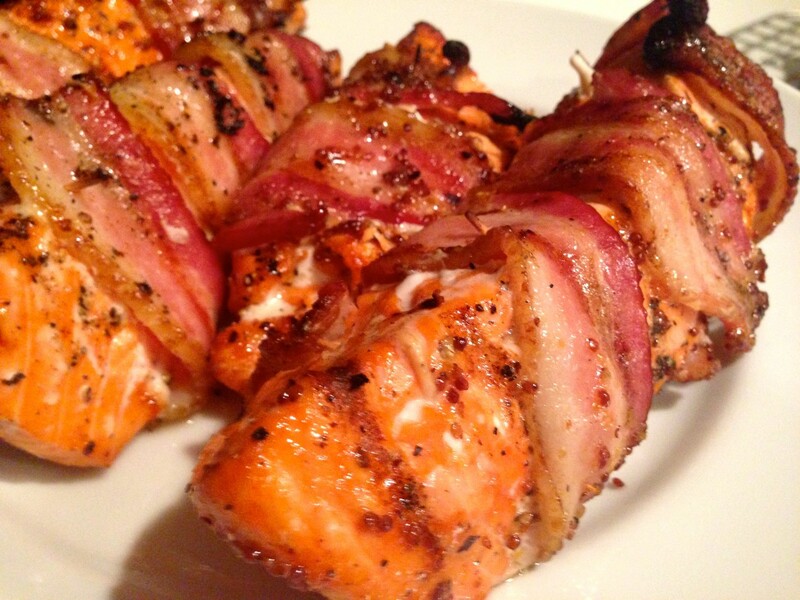 The skewer should easily go through the meat and there should be no trace of blood in the juices. 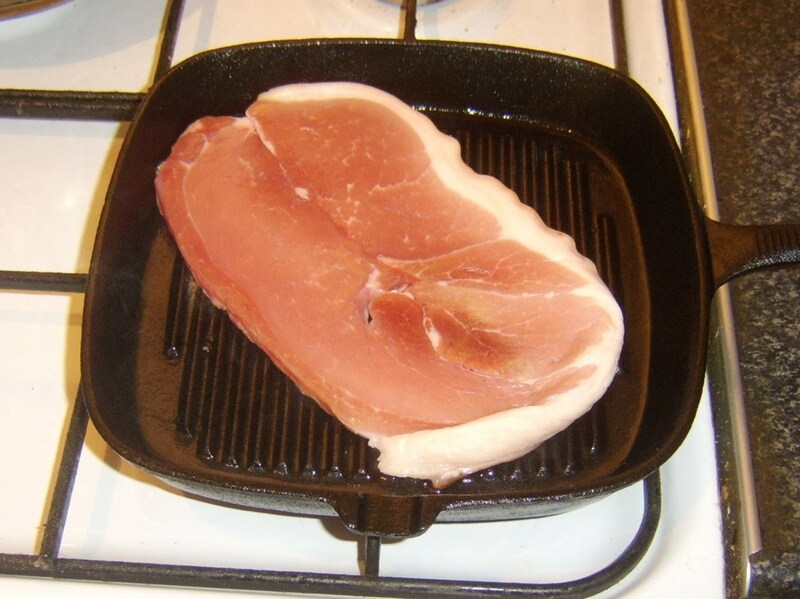 Start a deep pan of oil heating for roasting the potatoes and your griddle pan for the bacon. 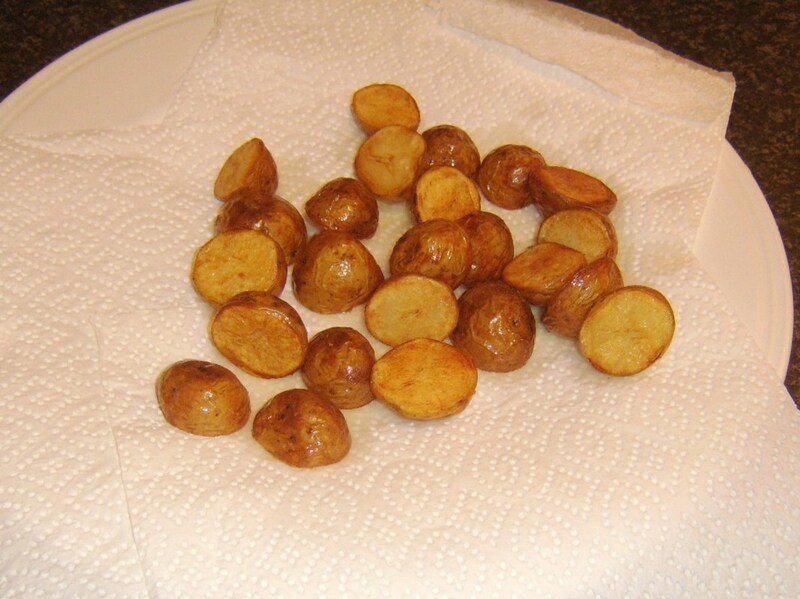 Deep fry the potato pieces for about five minutes until crispy then drain on kitchen paper. 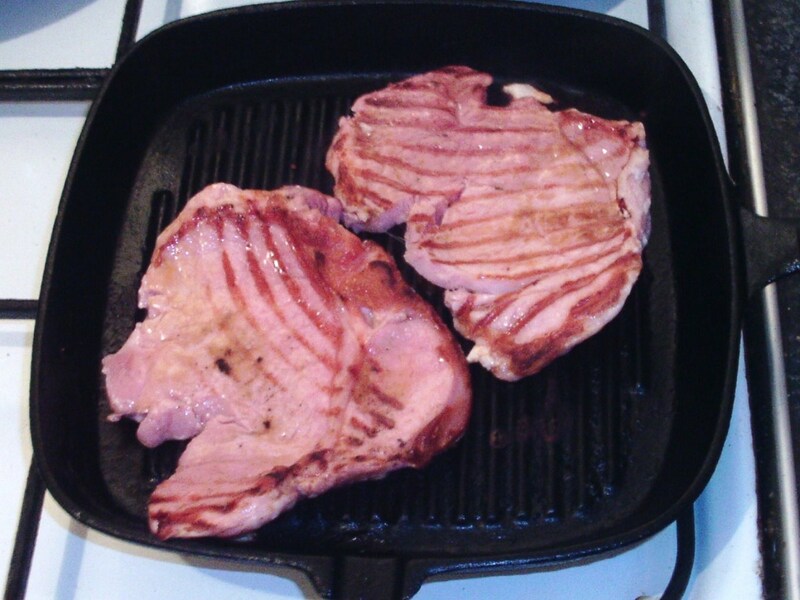 Use a pastry brush to lightly oil the bacon steak (using the oil in which it was baked) before griddling for a minute and a half to two minutes each side. 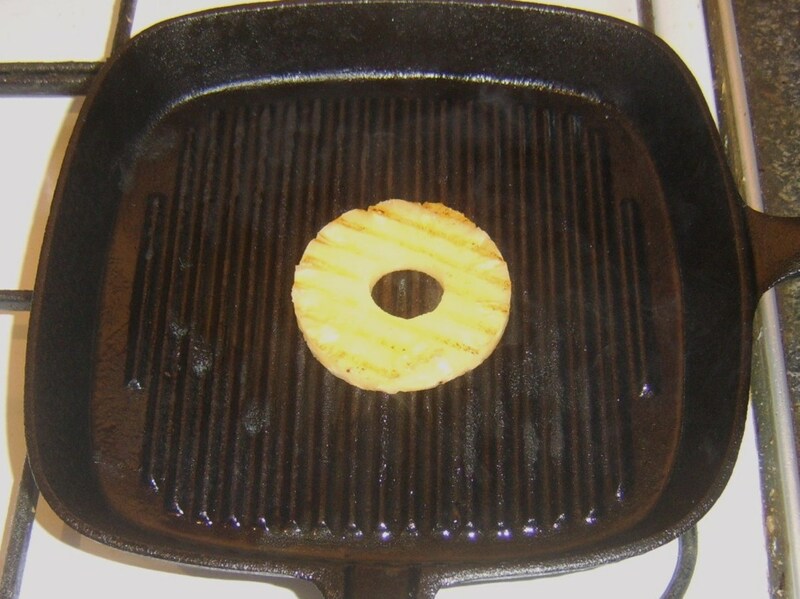 While it's griddling on the first side, you should brush the top with oil, ready for turning. 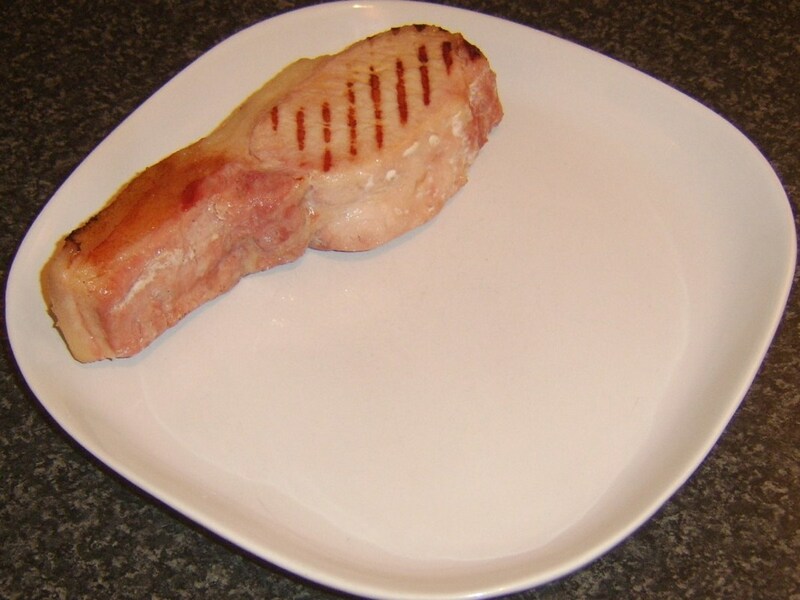 When the bacon steak is done, lift to a plate. 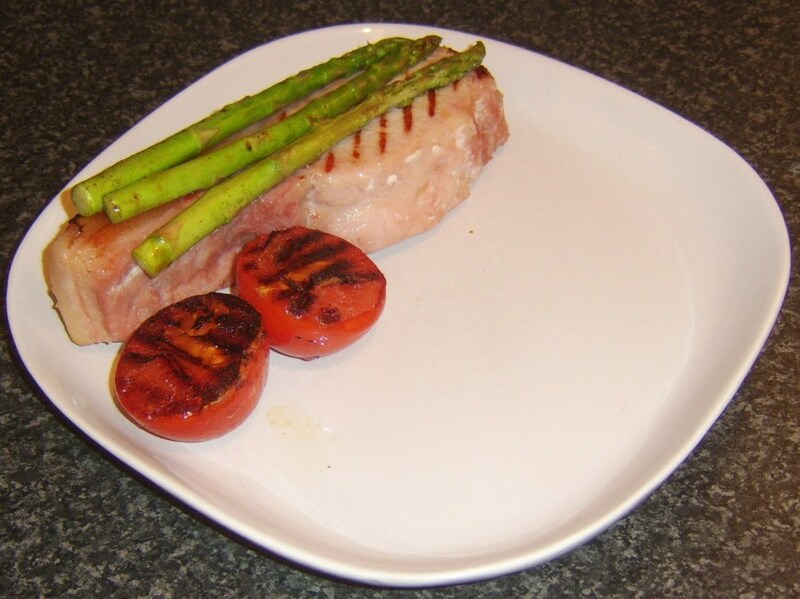 Turn the asparagus spears in the oil in which you baked the bacon and pat the tomato halves in it on their cut sides. 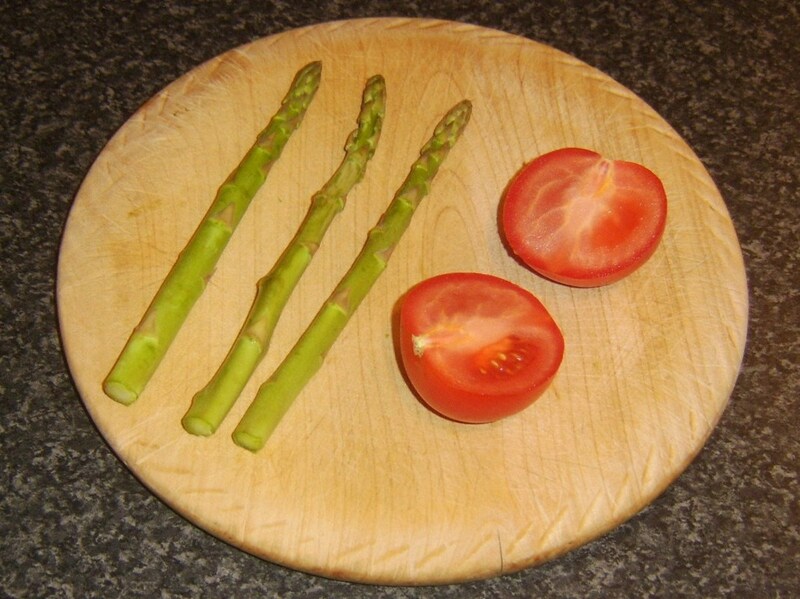 Lay the tomato halves in the hot griddle pan cut sides down and the asparagus spears alongside. 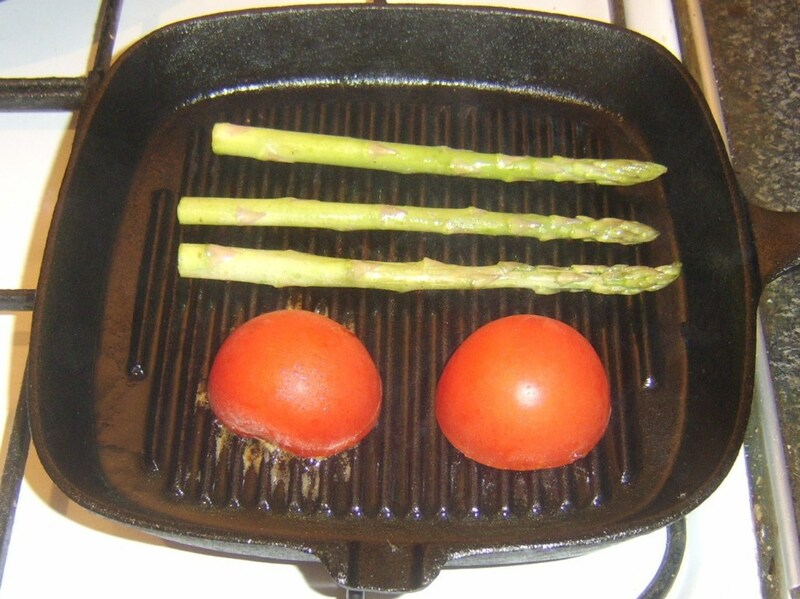 Griddle for around a minute, turning the asparagus spears only every ten seconds or so. 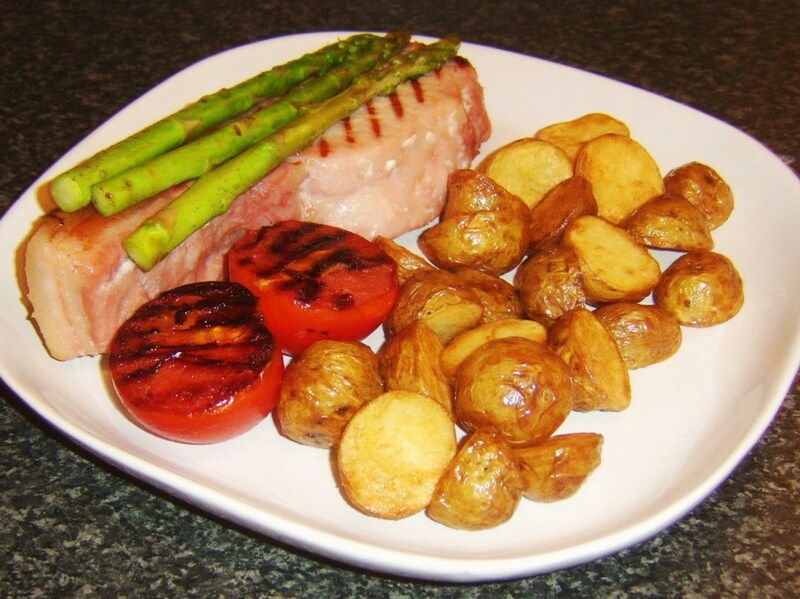 Lay the asparagus spears on the bacon steak, the tomato halves alongside with the cut sides up and plate the potatoes last of all to serve. Thanks, bethperry. I hope you're tempted enough to give one of them a go and enjoy it very much. 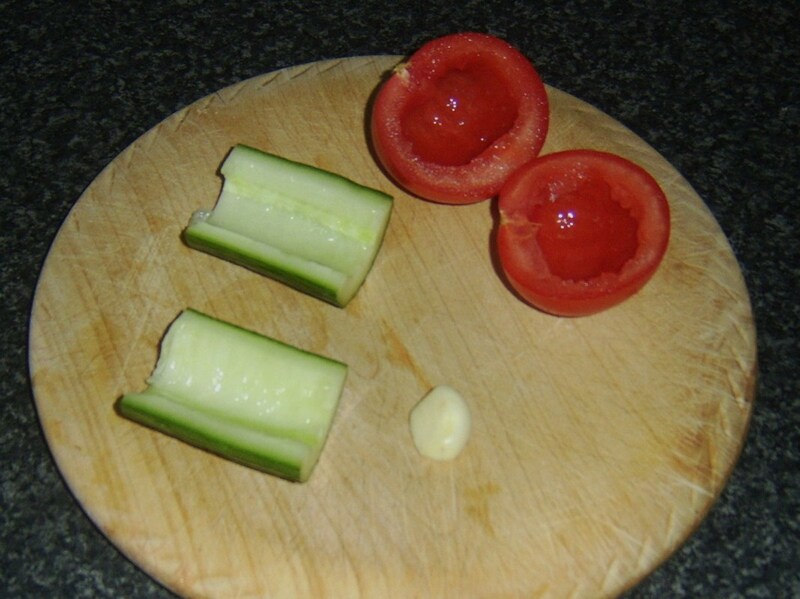 I love your visual presentation here! And the recipes sound so tempting! Thank you, randomcreative, for visiting and commenting. I'm glad there was some information here that may prove useful to you. I learned a lot here, and of course I enjoyed your recipes as always! Thanks for the detailed information and range of options.